In this review we feature the best wireless and wired speakers that provide superb sound quality and high fidelity sound from the best speaker brands. These speakers are designed to deliver high-fidelity sound performance, with crystal clear highs, detailed midranges and deep bass performance. They are great for those who are looking to get a set of speakers to blast music and have an enjoyable listening experience. Furthermore, some of these speakers on this list are designed for high-fidelity sound performance, which means that you get top-notch quality sound performance at high volume levels. We also liked the fact that these speakers have a portable design which makes them easy to carry around and take with you while travelling or outdoors. If you are looking for one of the best speakers from the top rated speaker brands, be sure to check out our top picks below! The UE Boom 3 is hands down one of the best speakers with immersive 360 degree surround sound and deep bass output. The Boom 3 is capable of producing a tonne of volume with balanced sound output for you to hear every beat in the music. It comes with a rechargeable battery which can pump out a good 15 hours of continuous music playtime on a single charge, and has a separate power up charging dock which allows you to charge the Boom 3 wirelessly. The speaker is designed to be incredibly portable and durable, and is entirely waterproof – you can submerge the speaker up to 1 meter of water for 30 minutes without any issues. It also comes with sleek one-touch buttons which allow you to play, pause and skip music directly on the Bluetooth speaker. We liked the fact that the Boom 3 comes with PartyUp functionality which allows you to easily pair multiple Megaboom speakers together for a surround sound experience. The Boom 3 speaker is designed to be extremely durable, and is covered in shimmering two-tone fabric that is tough and engineered for resistance to outdoor elements. If you are looking for one of the best speakers on the market, the Boom 3 is a great choice. The sound performance of the UE Boom 3 is crisp and well-defined, with good attention to detail and deep bass performance. The sound quality on the Boom 3 is very impressive and it has enough volume to fill up a large room with rich and clear sound. Music performances sounded exceptionally clear through the Boom 3, and came across as lifelike with very good tonal balance. The highs and midranges are crisp and clear, while the lower-bass ranges hits hard and punches deep. The speaker also has a 360 degree sound effect which disperses the sound evenly throughout the room or outdoor space, and is perfect for outdoor pool or parties. The UE Boom 3 can pump out a lot of volume and we were able to crank up the volume output to maximum on the Boom 3 without hearing any distortion. Bass-heavy music genres such as electronic dance music, rock and hip-hop sounded exceptionally good on the Boom 3, with deep punchy beats with crisp sound quality and vocals. The sound performance on the Boom 3 has a certain depth and quality that is rarely heard in portable speakers with this compact size. 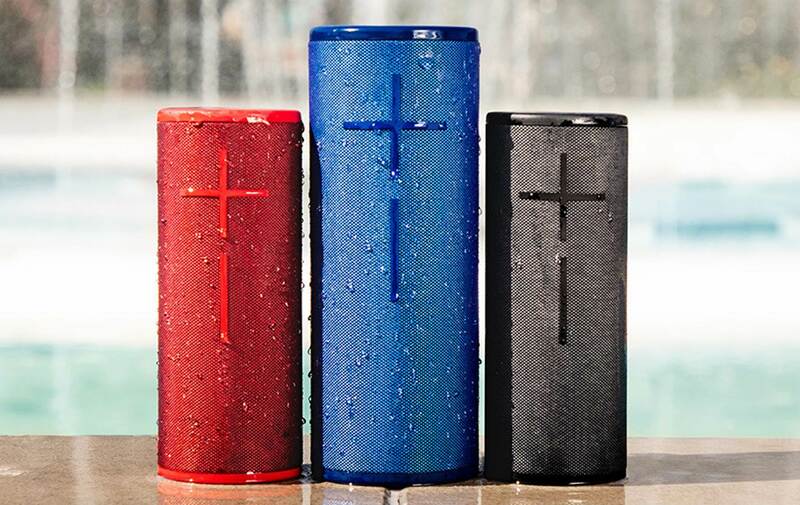 The UE Boom 3 has a very sleek and modern portable design with full waterproof casing. This means that you would be able to submerge this speaker underwater up to a depth of 1m for 30 minutes without any issues – and is perfect for outdoor use. The UE Boom 3 app has an equalizer function which works really well and tweaks the sound performance according to your preferences. The app also allows you to pair the Boom 3 with other UE speakers to create a much wider soundstage. The wireless Bluetooth range on the Boom 3 is very good and we did not experience any dips in sound quality while streaming music to the speaker. The Boom 3 is essentially designed as a tank, and comes with full waterproof, dustproof and drop-proof design which makes it extremely durable. We liked the fact that the UE Boom 3 is wrapped in a high-quality fabric material that shimmers and provides a unique aesthetic appearance. The speaker comes with a built-in battery life that delivers up to 15 hours of continuous music playtime on a single charge which is excellent. The Verdict? The UE Boom 3 is one of the best speakers we have come across. It is a speaker that can pump out quality audio performance with a level of depth and texture rarely heard in a portable speaker. The acoustic drivers on the Boom 3 are capable of delivering loud and immersive 360 degree sound with deep and accurate bass reproduction, allowing you to appreciate every single note in the music. The speakers have enough volume to fill up a large room with rich and filling sound and you can crank up the volume to maximum without hearing any distortion. The Boom 3 speaker is designed like a tank with waterproof and dust-proof protection; you can submerge it underwater up to 1m of water for up to 30 minutes without issues. 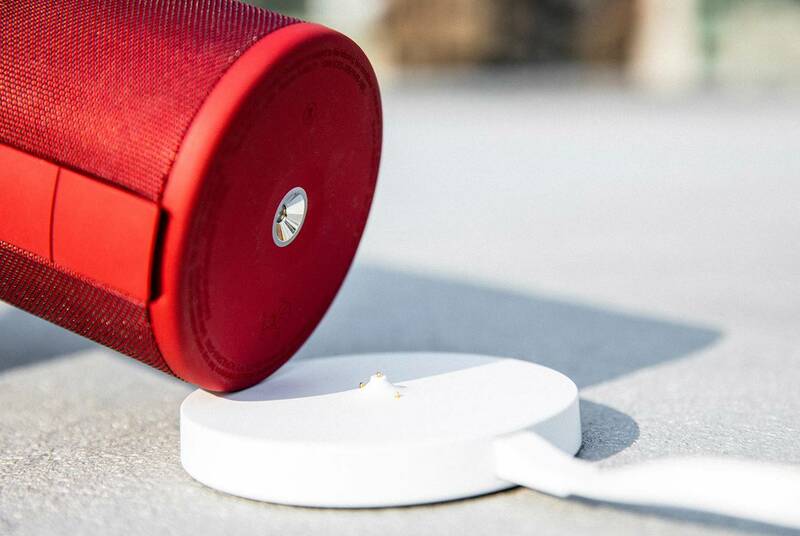 The buttons on the speaker are sleek and allow you to play, pause and skip music on the go. You can also use the UE app to adjust the equalizer settings or pair multiple Boom 3 speakers together for a more immersive sound experience. Overall, the UE Boom 3 is hands down one of the best speakers that deliver full-range sound quality with plenty of depth and we highly recommend them. The JBL Flip 4 is one of the best speakers to take with you outdoors, with really great sound performance, deep bass, a full waterproof design and wireless Bluetooth streaming capability. The sound quality of the Flip 4 is a vast improvement over its predecessor – the JBL Flip 3 – with stunning midrange, crisp highs and punchy bass that feels powerful and present. It features dual external passive bass radiators on the side of the speaker to enhance the bass response, which provides punchy beats in outdoor spaces to keep the party going. It features a built-in 3000mAh rechargeable battery which provides an incredible 12 hours of playtime on a single charge. You can also simultaneously connect up to 2 mobile smartphones or tablets to the JBL Flip 4 for wireless music streaming and switch between them at any time. Overall, the JBL Flip 4 is one of the best speakers we have tested and reviewed and is the ideal speaker for outdoor junkies. The sound performance of the JBL Flip 4 is phenomenal – it delivers extremely detailed midrange and crisp highs, with deep low-end frequency bass response that is enhanced by its passive bass radiators. Music performances through the Flip 4 sounded clear, crisp and well balanced; it can also go louder than its predecessor, the JBL Flip 3 which is an added improvement. The sound quality feels rich and detailed, and you can crank up the volume on this outdoor speaker without any distortion at near maximum volume levels. Vocal performances sounded detailed with amazing soundstage and music separation which felt incredibly life-like. Listening to electronic and hip-hop music also sounded very good and enjoyable to listen to with deep and punchy beats. We were truly impressed with the sound performance of the JBL Flip 4 considering its compact and portable size. It is truly one of the best outdoor Bluetooth speakers you can rely on to deliver great sound performance in an outdoor open environment. The JBL Flip 4 is designed to be rugged with an IPX7 waterproof exterior which makes it fully waterproof – you can even submerge the Flip 4 underwater without having to worry about damaging the speaker circuitry. The speaker weighs only a mere 1.4 lbs and is designed to be highly compact and portable. 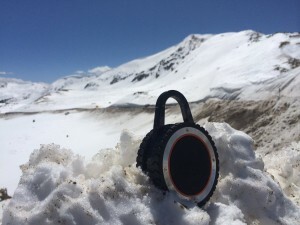 It also has a nice carabiner-like string at the top of the speaker which you can use to tie the speaker to your backpack or bicycle while outdoors. The button controls are located on the top of the speaker and are intuitive and easy to use – it has a power on/off button, Bluetooth connectivity button, pause/play and volume controls. The speaker also indicates the battery life at the top of the speaker when powered on, which allows you to know exactly when to recharge. We also liked the fact that the JBL Flip 4 came with the JBL Connect+ feature which you can use to link to more than 3 speakers at a time to create a bigger and wider soundstage, which is an incredibly useful feature outdoors. The Bluetooth connectivity on the JBL Flip 4 works like a charm and connecting it to our mobile device took a few seconds. The speaker will remember your device and automatically pair the next time you switch the speaker on – this is a really convenient feature which helps save time. The music quality streamed over the Bluetooth connection was really good and we did not experience any sudden dips or drops in sound quality. The Bluetooth range lasts a good 33 feet before the connection starts to dip off. The JBL Flip 4 also comes with a built-in noise and echo cancellation speakerphone for you to take hands free calls on the go. This is especially useful if you need to switch between listening to music and taking calls while driving or riding a bicycle. The Verdict? The JBL Flip 4 is easily one of the best speakers you can find for the outdoors and delivers really solid sound performance with deep bass response. The speaker is capable of producing very high quality sound with crisp highs, detailed midrange and a good deal of bass with its passive bass radiators on both sides of the speaker. The sound performance of the Flip 4 is simply incredible considering the compact size of this speaker. The JBL Flip 4 also feels high quality and durable, and is rugged enough for you to take it outdoors without any issues. It also comes with an incredible 3000mAh rechargeable battery that delivers an incredible 12 hours of continuous music playtime. It is one of the best speakers that have all the right combination of durability, sound performance and battery life for outdoor enthusiasts. The UE BOOM 2 is one of the best speakers with solid sound performance, deep bass response and great volume. It is waterproof, shockproof, designed for adventure (it is IPX7 rated waterproof up to 30 minutes and up to a depth of one meter). The sound on this outdoor bluetooth speaker is insanely good, with a loud 360 degree sound with deep bass and rich treble tones without sounding tinny or the bass distorting. If you are looking for one of the best speakers with enough volume for a large outdoor party gathering or barbecue, the UE Boom 2 will definitely do the job well. We were pretty impressed by the initial UE Boom speaker and the UE Boom 2 retains all the good characteristics of the UE Boom with some key improvements. The manufacturers claim that this device is 25% louder than the original UE Boom, and it can get pretty loud with no problems filling a large room or area with music. At full volume, you basically need to yell at each other to be heard over this speaker. The bass rolls off around 75% volume, and with the music of DSP, it still sounds clear even when maxed out. We found little to no distortion at full volume. The frequency response of these outdoor speakers are 90Hz – 20kHz, which means you will get more audible bass on your tracks. This unit has slightly larger, (1 ¾”) drivers as well as 2 (1 ¾” x 3”) passive radiators. The sound performance of the UE Boom 2 is truly impressive for an outdoor speaker of this size. When we tested the UE Boom 2 outdoors, we found that the sound was rich, layered and detailed, with crisp highs and mids and a noticeable low. The bass on these speakers are simply incredibly punchy and impactful, making every beat of the music come to live – playing electronica and rock or pop on these speakers sounded particularly good and we felt like we were in a disco party. The sound can go loud enough for outdoor parties, and the sound feels immersive and smooth throughout. We can safely say that the UE Boom 2 is easily hands down one of the best outdoor bluetooth speakers in terms of sound quality at an affordable price. Connection to your bluetooth device is simply a matter of pressing the Bluetooth connecter button on the top of the speaker and looking through the list of available Bluetooth devices on your phone, tablet or whatever and selecting the Boom. It is very intuitive interface to use and you would be up and running in a matter of seconds. Furthermore, this speaker has a whopping 15 hour battery life and 100 ft. bluetooth wireless range. The Boom 2 charges very quickly in around the 3 hour mark compared to other outdoor bluetooth speaker models. The Verdict? The UE Boom 2 is one of the best speakers to take with you when you go on outdoor adventures or places that require exposure to the elements. It is loud, crisp, easy to use and weatherproof. If you are looking for an excellent portable speaker you cannot really go wrong with the Boom 2. The UE Boom 2 features a really sleek and durable design and also has intuitive controls on the top of the speaker to adjust the volume and soundtracks. The design of the UE Boom 2 speaker is portable and compact which makes it easy to carry around in a backpack, and has a durable enclosure that looks like it can take a lot of abuse from the outdoor elements. Overall, it’s one of the best speakers available that provides very crisp sound quality with deep bass response, and comes highly recommended. The Logitech Z625 is a THX certified speaker system and is one of best speakers for desktop and computer gaming. The satellite speaker set and the subwoofer system deliver a collective output of 400 Watts of power that is capable of producing large volumes of sound and bass. The Z625 speaker system can be connected to 3 other entertainment devices simultaneously. The Logitech Z625 can operate with other systems that have a 3.5mm audio jack, optical or RCA inputs. The plug and play facility can connect via the 3.5mm audio jack and the RCA inputs to TV’s, computers, PlayStations, Xbox, Wii, smartphones, tablets and other devices. The sound can be controlled with the simple on-speaker volume-control and bass control plus power. This speaker system comes with a subwoofer of 130 Watts, two satellites with a power rating of 35 Watts each, an optical, 2 3.5mm audio, 1 RCA and 1 headphone inputs. Overall, the Z625 is one of the best speakers with crystal clear sound and deep bass for an immersive gaming experience. 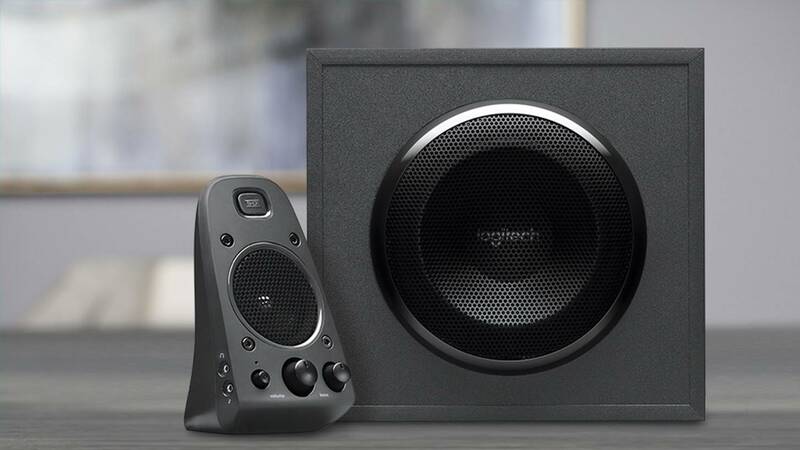 The Logitech Z625 THX certified speakers is a speaker system with satellites and additional woofer giving a collective power output of 400 Watts which can fill a large room with high volume sound. They complement PS4 setups really well and provide an immersive listening experience for console games. The speakers deliver crystal clear sounds and loud vibrating bass that considerably enhance the listening experience for a variety of purposes. The speaker system can be connected to different audio devices via an optical drive, audio jack and RCA inputs. The Logitech Z625 provides an enhanced music listening experience with its woofers. The THX certified system can be tuned to exact specifications to deliver theatrical performance when connected to TV’s and computers. The speakers are also well suited for gaming and can be connected to gaming consoles and PCs to listen to clear, loud game sounds for online and offline gameplay. The speakers have a high, clear volume output that makes it easy to listen to details such as bass within musical performances and treble sounds such as guitar licks and fingerstyle guitar playing in classical music. The speaker system can be adjusted and its woofers can be extended to be placed in different parts of the room while watching movies to experience cinema-like sound effects. The Logitech Z625 speaker system has an elegant design that comprises of the main speaker and two woofers on each side. The larger speaker has volume and sound controls such as bass, mid and treble ranges. The speakers are plug-and-play and can be connected to different devices such as TV, PlayStation, smartphones and other audio devices. The Logitech Z625 speakers have a sleek and compact design that allows them to be aesthetically consistent with sitting rooms and TV lounges. The speakers produce loud volumes of sound whose different ranges and levels can be controlled and tailored to the users’ needs. With gaming consoles, the speakers provide a rich gaming experience by delivering loud, clear sounds to the players. The speakers need to be connected to a power source in addition to the optical input to work with the PS4. The Verdict? The Logitech 625 THX certified speakers are some of the best speakers with a collective power output of 400 Watts. The speakers deliver crystal clear audio with loud bass that can be adjusted with volume controls. We liked the fact that this system comes with a dedicated subwoofer which enhances the lower-end output spectrum. 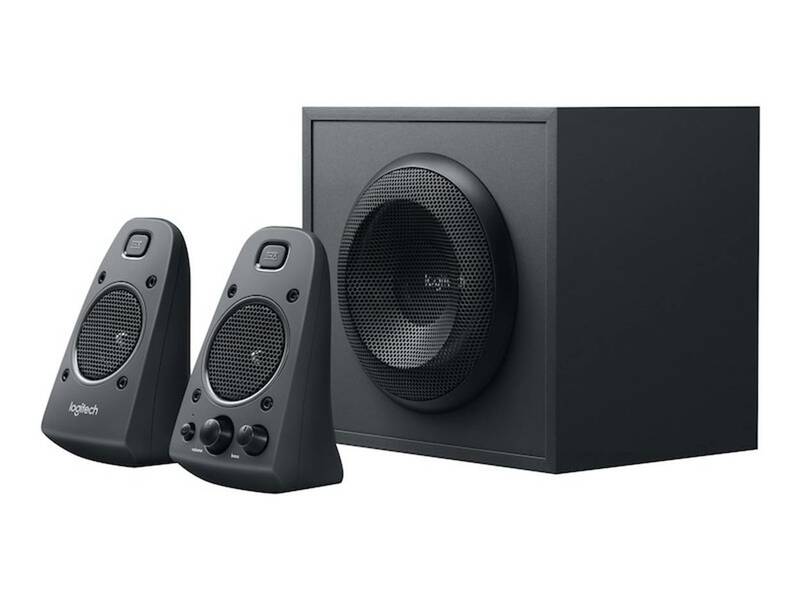 The Logitech Z625 speakers can be connected to TVs, PlayStation, Xbox, Wii, smartphones and tablets via optical, 3.5mm auxiliary and RCA inputs. The speakers are plug and play and can be placed anywhere in the house such as lounges, TV rooms, gaming areas and recording areas. The sound quality of the speakers is loud and crystal clear and can fill a large room with thundering sound. The sound quality gives a theatre-like experience when used to watch movies. The speakers come with a subwoofer with a power rating of 130 Watts and 2 satellites with a power rating of 35 Watts each. On the whole, the Logitech 625 speakers are some of the best speakers that provide a superb all-rounded listening experience with vibrant details and deep bass. 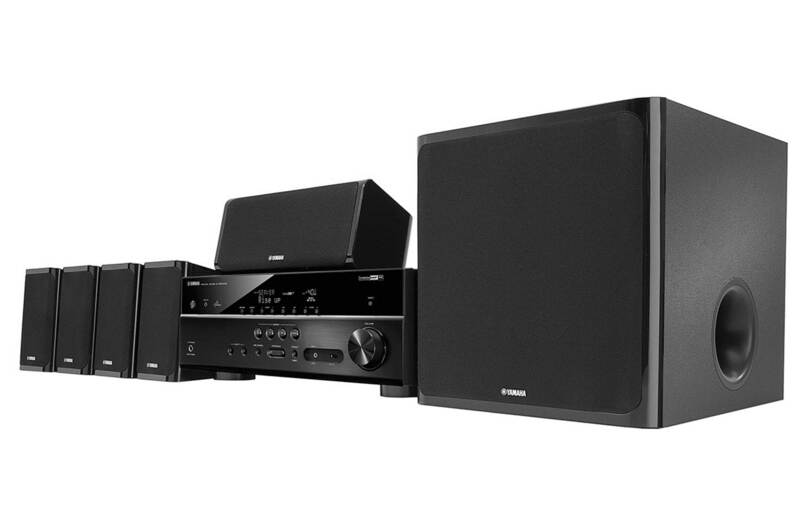 The Yamaha YHT-4930UBL is a 5.1 surround sound speaker system with Bluetooth. This all in one sound system delivers 4K Ultra HD pass-through with HDCP 2.2 support. The surround sound speakers deliver an impeccable range of crisp highs, well-defined mids and good bass in true surround sound. This 5.1 channel system automatically calibrates to your music or TV for optimal sound performance. The virtual cinema front and sleek, glossy fixtures will fit into any modern home theatre set up. This system includes the A/V receiver, 1 subwoofer, 1 front speaker, 4 surround sound speakers and a remote. The Yamaha YHT-4930UBL is an excellent system for both home theatre enthusiast and Bluetooth music listeners, and also supports 4k Ultra HD-pass through with HDCP 2.2 support for high quality movie streaming. It also comes with an extra-bass setting that provides more bass output from the smaller surround sound speakers for added effect. It’s one of the best speakers that comes with virtually everything you need to get started and we highly recommend them. The Yamaha YHT-4930UBL home theater in a box supports 4K Ultra HD sources and provides clarity and fidelity to movies and music performances. The Yamaha 5.1 channel system uses YPAO sound optimization to automatically calibrate for superior listening and adjust to the acoustic dynamics of each room. This allows the Yamaha YHT-4930UBL to deliver tremendous well-balanced sound and produce extra bass from the output of the smaller speakers. When the 6 -1/2inch 100-Watt subwoofer is utilized it improves the volume of the full low range from the entire 5.1 channel system – it delivers deep lows with good bass reproduction. The Yamaha YHT-4930UBL allows for 4k Ultra HD pass-through with HDCP 2.2 support, HDR Video including Dolby Vision, Hybrid Log-Gamma and BT .2020 which allows it to play the height of 4K Ultra HD media. This speaker system has a good balance of highs and lows and provides a great sound performance with little to no distortion. We thoroughly enjoyed watching movies and listening to music with this setup – the vocal and dialogue performances are clear, with very well-balanced music performance and solid midranges. They also have enough volume to fill up a large room with clear surround sound without any distortion and can really bring out the subtle details and sound effects in movies that you might not have noticed before. This 5.1 channel system is a home theatre in a box with the ability for Bluetooth connectivity. The Yamaha YHT-4930UBL 5.1 channel system has all the essential speakers for a great sounding TV experience by being built compatible with 4K Ultra HD pass-through with HDCP 2.2 support, HDR Video including Dolby Vision and Hybrid Log-Gamma, and BT.2020. These glossy black speakers are easy to be placed and will fit into any home theatre room. The system includes an A/V receiver, 1 subwoofer, 1 front speaker, 4 surround sound speakers for a traditional 5.1 channel experience. There is also a designated remote control to adjust sound and change the source at your convenience. This 5.1 channel system is also Bluetooth capable allowing you to wirelessly stream your favourite music to the system directly without the need for additional wiring. It also comes with an AV receiver which you can use to connect all the speakers and play music or watch movies in one place. The Verdict? The Yamaha YHT-4930UBL 5.1 surround sound speakers are some of the best speakers for home theatre enthusiasts and music lovers. It comes with all the surround sound speakers, subwoofer and AV receiver to help you get started right away. This 5.1 channel system provides tremendous bass and clear 4K Ultra HD pass through for an immersive home theatre experience. The speakers are well balanced with Yamaha’s YPAO sound optimization technology that provides clear sound with little to no distortion. We also liked the fact that the system comes with low-range bass enhancement technology which provides richer bass response from smaller speakers while maintaining good localization and soundstage. 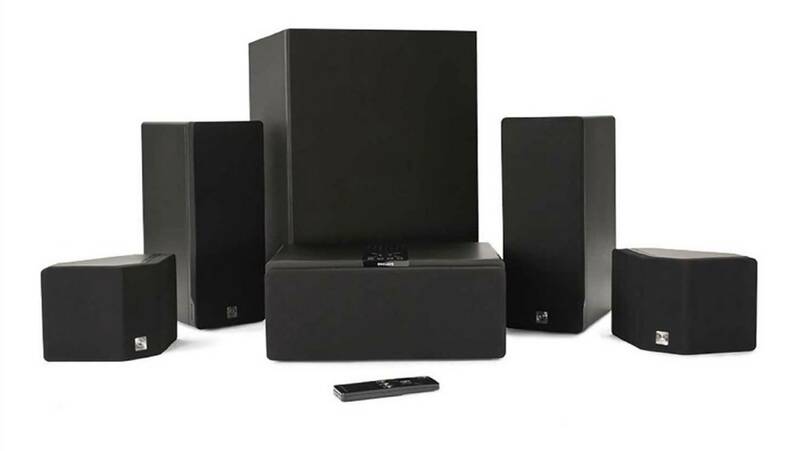 Their black glossy style creates a surround sound system that can complement any modern home theatre interior. This 5.1 channel system also features Bluetooth technology, so you can connect and listen from your smart phone, tablet or computer at your convenience. Overall, the Yamaha YHT-4930UBL 5.1 channel home theatre in a box system is one of the best speakers and we highly recommend them for beginners or entry-level audiophiles looking for a convenient and easy surround sound setup. The Anker SoundCore Pro is one of the best speakers that provide a full 25 watt audio performance with four professionally tuned drivers. The speaker comes equipped with 2 full-range drivers and 2 tweeters which provide full-bodied sound performance with luscious treble and rich bass ranges. The speaker comes with a digital signal processor to ensure that every layer of audio is delivered smoothly. The SoundCore Pro features exclusive BassUp technology which adds new depth to the soundscape, and provides deep bass response at low volumes. We liked the fact that the speaker comes with a built-in battery life that provides for up to 18 hours of continuous music playtime with a built-in USB port to charge your device while listening to music. Furthermore, the speaker is IPX4 water-proof rated and provides protection against rain, spills and splashes. The SoundCore Pro is equipped with Bluetooth 4.2 with NFC pairing and an auxiliary input port for non-wireless music sources. 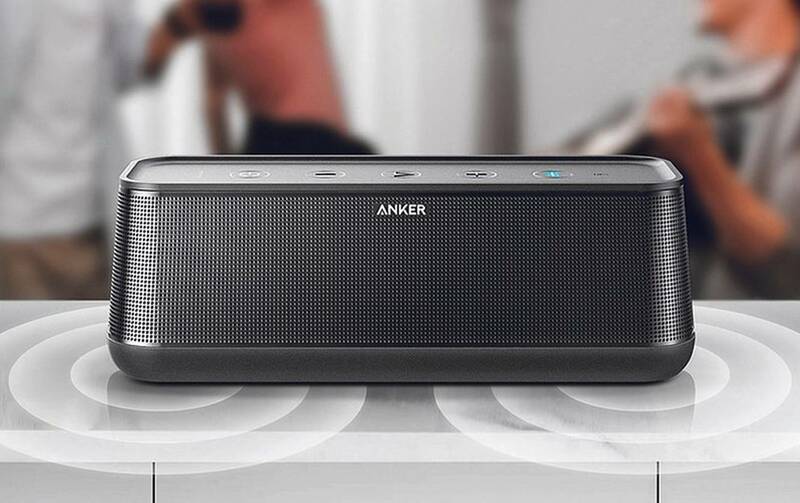 On the whole, the Anker SoundCore Pro is one of the best speakers that provide really good playtime and sound quality, so don’t forget to check them out! The Anker SoundCore Pro is easy to setup and delivers really good sound quality. The highs and mids are clearly defined with very good soundstage, and the bass response hits hard and sounds very punchy. The bass stays where it should be as bass and does not muddy into the midrange frequencies; it adds a layer of depth and complexity to music performances. The speaker produces a good balance between the highs, midranges and bass without muddying the frequencies – music performances sound accurate and well-defined. Vocal performances had good stereo separation and some degree of soundstage which allows you to appreciate where each note is coming from. You would be able to adjust the volume to its maximum setting without hearing any distortion. If you are looking for a great sounding speaker that can deliver accurate and clear stereo sound with 25 watts of pure power, the SoundCore Pro is definitely a great choice. The SoundCore Pro comes equipped with a lot of features that makes it very high quality. It supports digital signal processing which improves the overall sound performance, and comes equipped with 2 full-range drivers and 2-tweters for full-bodied sound. It has very nice treble and timbre ranges that do not sound harsh at any volume level. The SoundCore Pro also features BassUp technology which helps to enhance the low-end frequency ranges and improve the overall bass response. 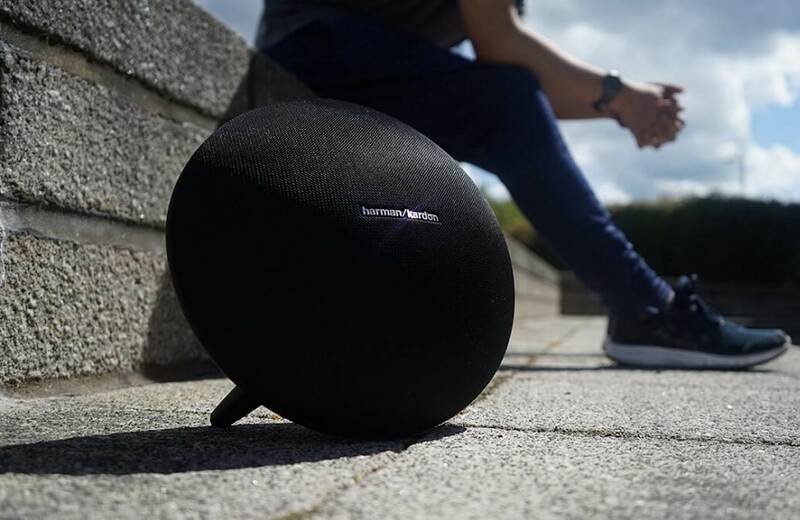 The SoundCore Pro speaker comes equipped with a 8000mAh battery that can provide an incredible 18 hours of continuous music playtime on a single charge. The built-in USB port with PowerIQ fast charging allows you to play music and charge your device simultaneously. 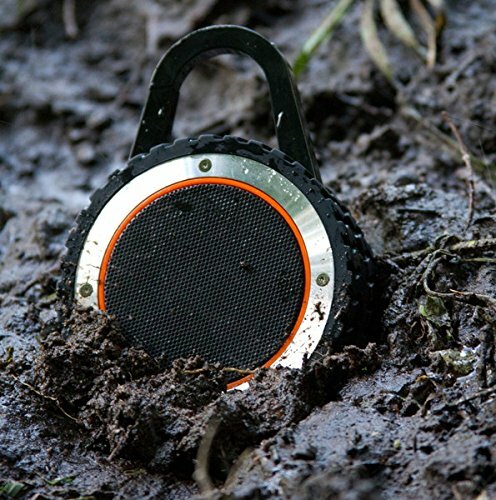 The speaker is IPX4 waterproof which protects the speaker against rain, spills and splashes. It also has full NFC capability for fast-pairing with mobile devices and Bluetooth 4.2 for high quality music streaming. The Verdict? 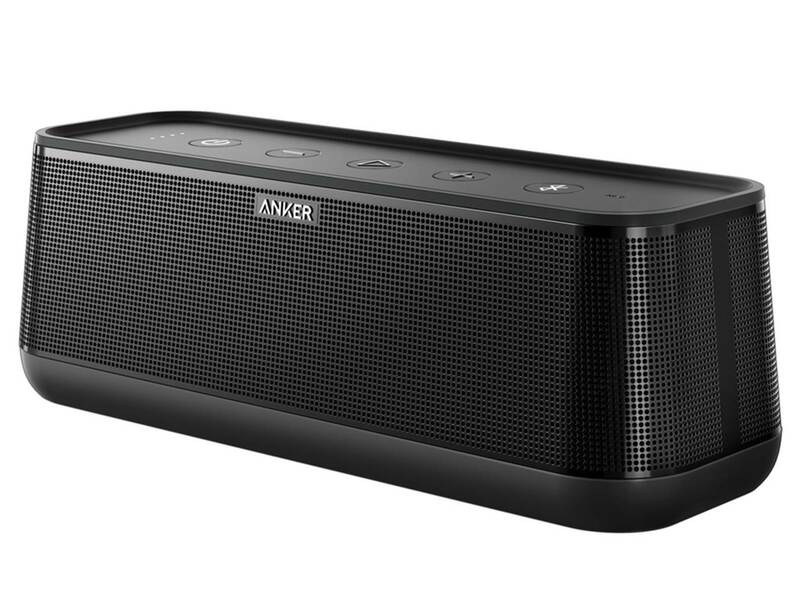 The Anker SoundCore is one of the best speakers with a full-range 25 watt audio performance. The speaker features four acoustic-tuned drivers with digital signal processing to provide high quality sound performance; the sound quality from the speakers is crisp and crystal clear with vibrant highs and smooth midranges. The bass response on the SoundCore speaker punches deep and it also has BassUp technology which adds depth to the soundstage. Music genres such as electronic dance music, country folk and jazz sounded smooth and well-defined on the speaker. 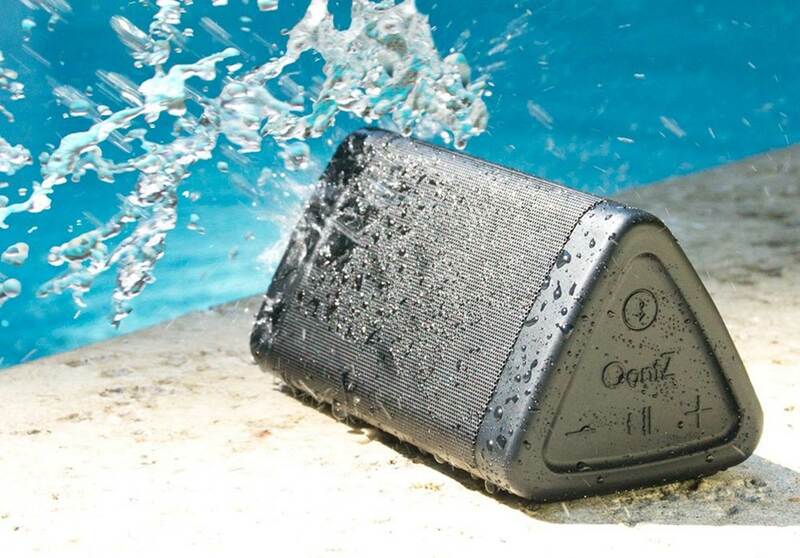 The SoundCore speaker is also IPX4 waterproof rated which provides protection against water and splashes. The entire package comes with the SoundCore Pro speaker, micro USB cable and user manual for easy reference. On the whole, the Anker SoundCore Pro is one of the best speakers we have tested and we highly recommend them. The Sony SSCS3s are some of the best speakers you can find that delivers superb sound performance. Each floor standing speaker features a 3-way, 4-speaker bass reflex system with a 5-1/4” foamed mica reinforced woofer and a 1” polyester main tweeter for wide dispersion sound performance. The mica-reinforced drivers are designed to deliver high fidelity sound performance, with the bottom layer of the driver diaphragm delivering enhanced bass response. It also comes with a ¾” Sony super tweeter for immersive sound staging – the super tweeter is specially designed to deliver ultra-responsive, high-frequency audio response up to 50kHz for high resolution audio. If you are looking for some of the best speakers for high-resolution audio, the Sony SSCS3s are definitely a great option to have. The speakers have a 6 ohm power impedance and have an optimized crossover for clear audio with a 145W maximum input power. The end result is that these speakers are capable of producing tight, powerful bass response with crystal clear sound and great clarity. 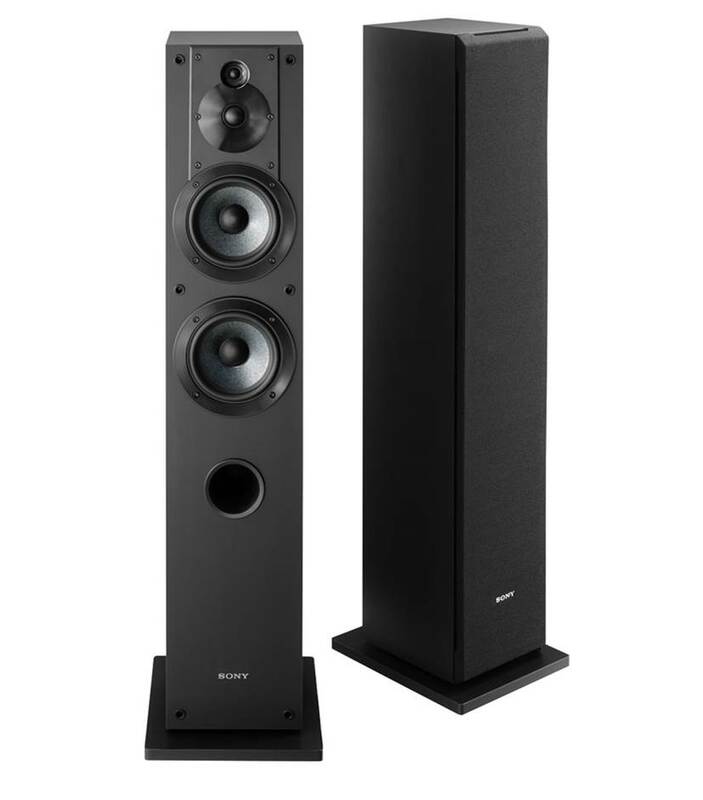 If you are looking for some of the best floor standing speakers to complement your home theater setup or just for audio listening, the Sony SSCS3s are among the best you can find at an affordable price. The sound performance of the Sony SSCS3s are some of the best we have heard – the speakers are capable of producing very good audio quality when paired with a decent receiver. The frequency range on these speakers is much lower which gives better low-end response. It also has a relatively good wattage compared to other floor standing speakers which makes the Sony speakers sound much louder and crisp. Watching movies with these speakers was a very thrilling experience and felt like we were sitting in a real live theater, with realistic sound effects and deep bass. Cannon blasts and grenade explosions sounded impactful and nearly lifelike, while vocal dialog was cleanly reproduced without sounding shrill or harsh. We also liked listening to music with these speakers – you get really crisp highs, detailed midrange and very good soundstage. The details in the music are well separated and defined; if you listen to live concert recordings with these speakers, you can actually almost tell where the instrumentalists and vocalist is on a stage. We were very impressed by the overall sound quality of these floor standing speakers and how much performance you can actually get of these speakers. The 3-way, 4-speaker design of the Sony SSCS3s works very well with the integrated crossover to create distinct sound effects. The entire speaker looks really sleek when placed on the floor, and comes with a nice speaker cover over the acoustic drivers. The cabinet designs are solid and durable, and rest on a solid surface which prevents the speaker from vibrating when the volume is turned up. The acoustic drivers are capable of producing room filling sound but do require some audio positioning to get the best depth and soundstage. They are the perfect speakers to complement your home theater setup and work well as standalone left or right channel speakers. Do note that the Sonys are not powered speakers and will need to connect to an audio receiver with speaker wire to power the speakers. The Verdict? The Sony SSCS3s are some of the best speakers you can buy that really delivers on sound quality and performance. The sound quality from these speakers is very good, with crisp highs, detailed midrange and a good amount of bass. The crossover design on these speakers is very efficient and comes with built-in micro reinforced drivers that produce high-fidelity sound. The Sony speakers also come with a wide-dispersion super tweeter that can deliver a wide frequency response up to 50kHz. Vocal performances on this speaker sounded natural and nearly life-like, and you can really pick up the details in the music such as subtle instrumental notes with these speakers. 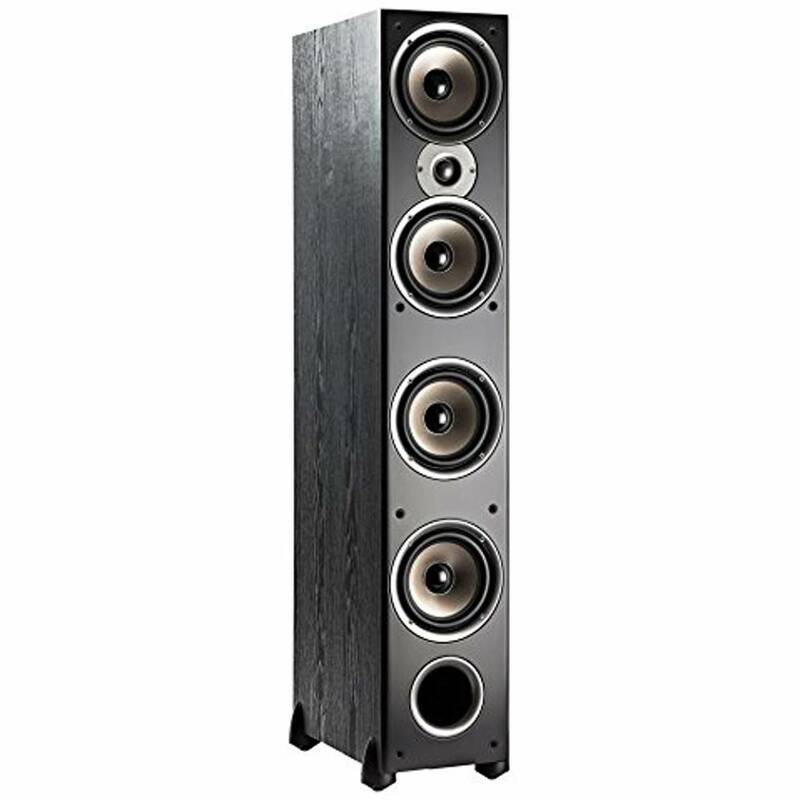 These floor standing speakers also have a good deal of soundstage and music separation which gives a good sense of space while listening to these speakers; live concert recordings will definitely sound much more detailed and well defined with the Sony SSCS3s. If you are looking for one of the best speakers at a good budget price, the Sony SSCS3s are definitely worth checking out. The Polk Audio Monitor 70 Series II are some of the best speakers that are more advanced and high powered than the Polk T50s, the Polk Audio Monitor 70 Series II will blow you away with its incredible sound performance, although at a slightly more expensive price point. In our view, these speakers are simply the best floor standing speakers in the Polk Audio line and we couldn’t believe the difference the extra watts of power made when powering these speakers. The M70s are simply a cut above the rest and really deliver good quality sound performance on a budget, so don’t forget to check it out. The Polk Monitor 70 series comes with 1-inch fabric/polymer composite Dynamic Balance dome tweeter with an integrated neodymium magnet structure to deliver clear and detailed high frequency response for realistic reproduction of vocals and instruments. The 5 1/4-inch bi-laminate composite dynamic balance drivers are lightweight and stiff with good damping for high efficiency, excellent bass and lower distortion. It comes with a cascade tampered array design – both drivers play bass frequencies but only the upper driver plays upper-midrange frequencies. This method of sound reproduction provides maximum bass output along with precise imaging and detailed midrange response. Finally, the T50s come with a non-resonant all-MDF enclosure to produce cleaner lifelike sound quality. We were literally blown away by the sound performance of the Polk Monitor 70 series. These speakers are excellent at creating a seamless soundstage, and specially so with the center channel. The sound feels natural and consistent and deals with many voices smoothly and beautifully. After hooking the M70s we could hear the midrange and full sound with perfect clarity – an experience that has solidified our recommend for this line of Polk floor standing speakers. If you are a person who enjoys listening to different genres of music you will love these set of speakers because of the amount of life and clarity they bring. We found ourselves re-listening to country, disco and jazz music and they sound like we have never heard them before. You will hear nuances and sounds that you could never have thought were there before. In short, the music sounds exceptionally good – the bass is deep and clean. Although you may wish to attach a subwoofer to the M70s, we felt that no sub was necessary. The M70s exceeded our expectations by providing excellent sound with a beautifully crafted quality construction. The Verdict? The sound quality of the Polk M70s is unbelievable and it is hands down one of the best speakers you can find in terms of audio performance. Not only do they produce awesome sound, with top-notch highs and mids, they will literally make you fall in love with your music again. The bass is good and not the earth shattering type, which is pleasant and nice to listen to.We really liked the multiple small-diameter driver design which delivers wide dispersion for an open, “box-less” three-dimensional sound which makes your movies and soundtracks come to life. In sum, the M70s are probably one of the best speakers for your home theatre system and we can safely say that this would be one of the best investments you can make for your home audio without any regrets. The JBL Xtreme is one of the best speakers specially designed and built for bass reproduction. This mammoth Bluetooth speaker comes with dual external passive radiators at both sides that delivers some of the deepest and punchiest bass we have heard – and comes second only to the JBL Boombox. The sound quality that you get from the JBL Xtreme is top-tier, with very crisp treble ranges, smooth midrange and the bass has plenty of punch and depth. They are loud enough to power an entire party and have a massive built-in battery that supports up to 15 hours of continuous music playtime. The battery charges via dual USB ports and can also double as a power bank for your smartphone devices. Overall, the JBL Xtreme are some of the best speakers you can find for high quality music listening and we recommend them. The JBL Xtreme supports wireless connectivity to up to 3 smartphones or mobile devices at a time and delivers really quality stereo sound performance. Furthermore, the JBL Xtreme is built like a tank with a durable splash-proof design which makes it resistant against water and rain. 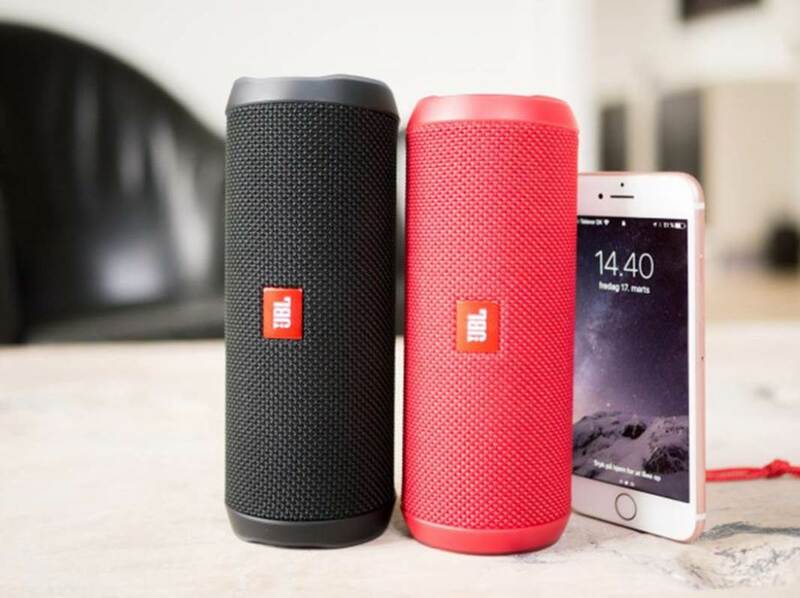 If you are looking for one of the best bass Bluetooth speakers that will deliver superb sound performance, the JBL Xtreme comes highly recommended. Where the JBL Xtreme shines is in the loudness and clarity in the sound that you get from these speakers. The bass hits extremely hard and feels impactful but does not muddy into the midrange frequencies or overwhelm the other frequency ranges. We also liked the fact that you can pair two JBL Xtremes together to create stereo sound and a wider soundstage, which is ideal for large outdoor gatherings or pool parties. This speaker is quite sensitive to EQ changes which mean that you can tweak the sound output according to your desired music preferences. The highs and midranges sound detailed and smooth on the Xtreme without any harshness or distortion at close to maximum volume levels. Vocal performances sounded very well-defined and detailed, while bass-heavy music genres such as electronic dance music and rock or hip-hop sounded very punchy right off the bat. The lower-midrange frequencies feel solid with plenty of depth and you feel that the sound has gravitas without any muddiness. In terms of sound quality, the JBL Xtreme really does get it right and can produce a tonne of volume with plenty of bass output while maintaining an all-rounded sound texture and frequency response. When we combined two JBL Xtreme speakers together using the JBL Connect app, you can really hear the detailed sound stereo separation from both channels in a much wider soundstage. 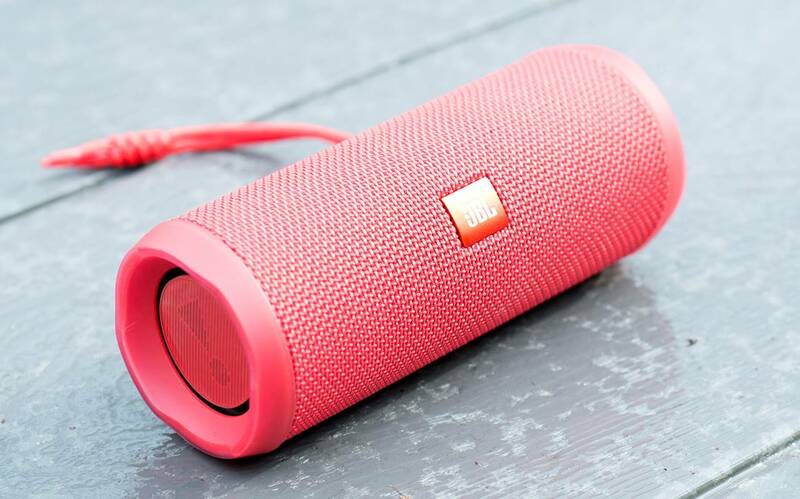 The JBL Xtreme has an extremely durable and rugged design – the entire speaker is built like a tank which allows you to take it outdoors or by the poolside without any issues. The speaker is covered by durable wire-type cloth mesh and reinforced by rubber surrounds which keep the speaker intact. The Bluetooth buttons and volume controls are located at the top of the speaker for easy adjustment. The JBL Xtreme has splash-proof resistance and can survive direct contact with water, although it should not be fully immersed underwater. 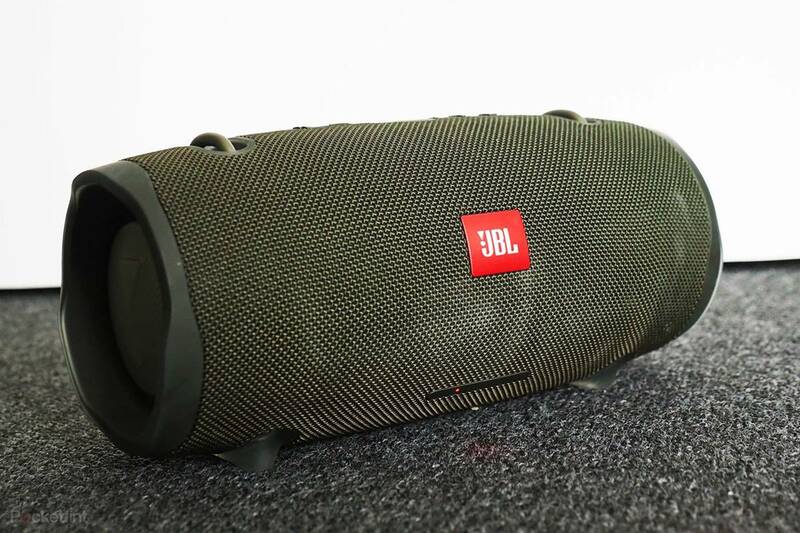 The JBL Xtreme speaker has a very sleek and eye-catchy design; it features dual external passive bass radiators at both sides of the speaker which vibrate and produce bass – you can see the bass radiators vibrating like mini-subwoofers and they produce deep and punchy bass response. The speaker comes with a massive 10,000mAh battery that supports up to 15 hours of continuous music playtime and it also comes with a built-in microphone for you to take calls on the go with a touch of a button. The splashproof fabric comes in black, blue or red designs to choose from. The Verdict? The JBL Xtreme is one of the best speakers you can find that delivers extremely powerful bass response – and is second only to the JBL Boombox. These speakers are capable of producing deep, punchy bass with plenty of depth and the lower-midrange frequencies sound rounded and very accurately reproduced. Vocal performances sounded crystal clear on the JBL Xtreme, while music genres such as electronic dance music and rock and hip-hop sounded very punchy and lively with plenty of depth and finesse. We also liked the fact that the JBL Xtreme comes with a built-in 10,000 mAh battery that delivers up to 15 hours of continuous music playtime on a single charge and comes with a splash-proof fabric that provides added water-resistance. The wireless Bluetooth streaming works very well on the JBL Xtreme and you can connect up to 3 Bluetooth devices to the speaker simultaneously. The JBL connect app also allows you to pair two JBL Xtreme speakers together for a much wider soundstage and with stereo separation. Overall, it’s one of the best speakers we have encountered and comes highly recommended. The Bose SoundLink Revolve is one of the best speakers that have deep, clear and immersive sound with a true 360 degree sound coverage. It is built primarily for home use although it is relatively portable. The unique design of the SoundLink Revolve speaker allows instruments and vocals to naturally separate and spread across an immersive soundstage with 360 degree coverage. It is crafted with a sleek aluminium body which is durable and water resistant up to IPX4, and comes with an incredible battery life of up to 12 hours of continuous playtime. The SoundLink Revolve also supports wireless pairing with your mobile devices with voice prompts, and allows you to take calls or access Siri or Google Now from the speaker microphone. You can also pair two speakers together for extra sound and larger sound coverage. If you are looking for one of the best speakers for your home and want immersive surround sound with good bass depth, the Bose SoundLink is a great choice. When we first tested the Bose SoundLink, we were surprised at how much sound such a relatively compact speaker could produce. The sound which this Bluetooth speaker produces fills the entire space easily and has depth and good bass response. The 360 design of this speaker allows the sound to separate out evenly with detailed clarity – we were extremely pleased with the rich quality of the sound and impactful bass. The 360 degree design of the speaker allows for convenient placement anywhere in your living room and it will disperse sound – it delivers deep bass that scales up with higher volume levels. Bass-heavy music genres such as electronic dance music sounded very punchy right off the bat, and the drum and lower-midrange frequencies were reproduced with distinct clarity. The one advantage that the Bose SoundLink has over other speakers is the level of clarity that you get with these speakers while maintaining deep bass impact – the bass stays where it should be as bass and does not muddy into the midrange or upper range frequencies. The timbre ranges on the Bose speaker is nice and sharp and sounds delightful to listen to. We really liked the design of the Bose SoundLink speaker and it blends in easily with modern home interior decor. The speaker itself feels very high quality and the round aluminium finish gives it a very elegant appearance throughout. The speaker is also relatively compact and lightweight which means that you can take it with you easily. The battery life on this speaker is incredible and can last a good 12 hours on a single charge. We also liked the fact that we could connect this speaker up to two mobile devices and the setup was almost instant with the Bose Connect App. The speaker also charges fairly quickly with the included micro USB. The voice prompt functionality was also useful to guide us through the wireless pairing process with our mobile device. 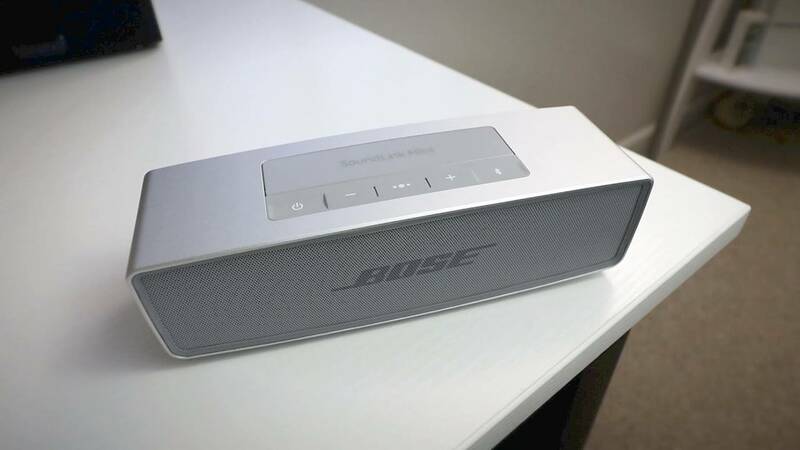 In this regard, the Bose SoundLink Bluetooth speaker has all the functionality that you would expect from a modern Bluetooth speaker with the ability to adjust EQ settings on the fly. The SoundLink Revolve comes equipped with an auxiliary input in case you need to connect the speaker to other non-wireless sources. The speaker itself is designed for portability and the cylindrical shape of this wireless speaker makes it easy to grab and travel on the go. One great aspect about this speaker is that it is water-resistant which means that you can take it to the pool or the beach without having to worry about splashes of water damaging the circuitry. It is also possible to pair two SoundLink Revolve speakers in party mode through the Bose Connect App to increase the overall sound performance; this is perfect if you need to use this speaker in wide open spaces or for a larger party. The Verdict? We thoroughly enjoyed the sound quality and deep bass from the Bose SoundLink Revolve. It’s one of the best speakers that can deliver loud 360 degree sound while maintaining consistent and impactful lows – the highs and midranges sound detailed and refined. Apart from the stylish and sleek aluminium finish, the speaker itself is designed to be extremely durable and water resistant which is a nice feature to have for poolside parties. The battery life is a good 12 hours of continuous playtime on a single charge, and the speaker can be paired with another SoundLink Revolve for a much wider soundstage in outdoor spaces. 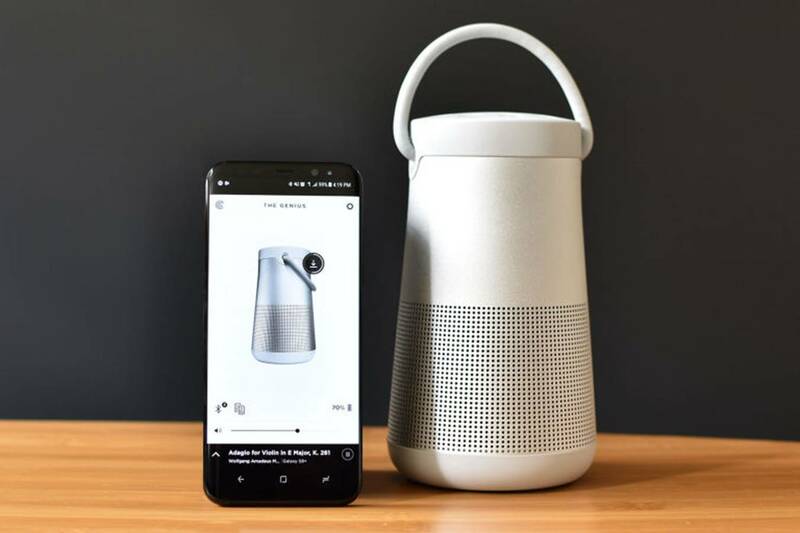 The Bose SoundLink can also connect instantly to your mobile device via the Bose Connect App which also provides firmware updates to enhance the sound performance of the SoundLink Revolve. While the bass output from the Bose SoundLink is not has heavy or huge as the JBL Xtreme speakers, it’s a really refined looking speaker that delivers quality sound performance with plenty of depth and impact. If you are looking for one of the best speakers for your home, we highly recommend checking out the Bose SoundLink Revolve. The Harman Kardon Onyx is one of the best speakers that deliver really powerful sound performance and a sleek design in a single package. It is a home Bluetooth speaker that excels in terms of versatility and sound performance – the acoustic drivers are capable of delivering full-range sound quality with virtually no distortion at high volume levels. It comes with a built-in rechargeable battery that supports up to 8 hours of continuous music playtime on a single charge and allows you to stream music wirelessly via Bluetooth from your smartphone devices. You can also connect up to 2 smartphone devices at the same time, or pair two Studio 4s together with the Harman Kardon Connect+ app. The Onxy Studio 4 speaker also comes with a built-in microphone with Voice-Logic echo and noise cancellation for you to take conference calls from the comfort of your home. It also supports Siri and Google Now apps with a simple touch of the button. If you are looking for one of the best speakers for home audio entertainment, the Onxy Studio 4 speaker comes highly recommended. 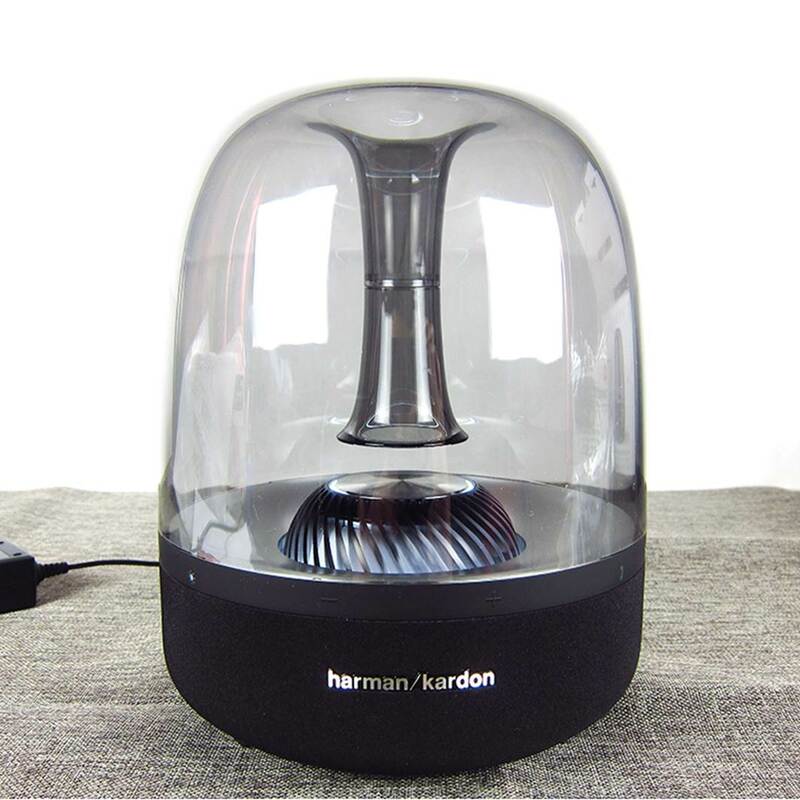 We were really impressed by how good the Haram Kardon Onxy Studio 4 sounded straight out of the box. The speaker is slightly larger than expected and comes with nice packaging – it is relatively heavy which indicates that it is made out of quality materials. The speaker can produce a tremendous amount of volume and get really loud – it delivers crisp highs, detailed midranges and deep bass that resonate throughout the entire room. You can practically crank up the volume on the Studio 4 to maximum and not experience any distortion, with crystal clear vocals and consistent sound output. The bass and treble ranges blend in smoothly and do not sound harsh or muddy at all – the bass hits hard and produces deep punchy beats that you can feel. Bass-heavy music genres sounded really good with the Studio 4 speakers – electronic dance music was punchy and tight, while rock and hip-hop sounded crystal clear with plenty of lower-midrange notes. Vocal performances are reproduced with pristine accuracy and you can hear every single detail in the music with a decent degree of stereo separation. The bass effects and voice clarity that the Studio 4 speaker has is simply outstanding for a home Bluetooth speaker in this category. In short, if you are looking for a speaker with incredible music sound quality, the Onxy Studio 4 is the way to go. The Studio 4 speaker is relatively large and is perfect for placement in the living room or dining room where most people can enjoy the music. It features a really unique curved design that blends in nicely with modern home interior décor with a sleek appearance. The speaker comes with a nice and stable base with two feet at the back which helps to balance and secure the speaker in place. Despite the speaker’s relatively large size, it comes with a handle at the top which makes moving the speaker really easy. The studio 4 speaker allows you to connect up to two Bluetooth speakers at the same and interchange between them which is really convenient. You can also connect two or more Studio 4 speakers together using the Harman Kardon Connect app. The speaker power buttons are located behind the speaker and fit in nicely with the overall design. The Studio 4 has a built-in battery that delivers up to 8 hours of continuous music playtime on a single charge. We also liked the built-in microphone with noise cancellation technology which allows you to take conference calls over the speaker from the comfort of your home – all in all a very neat setup. The Verdict? 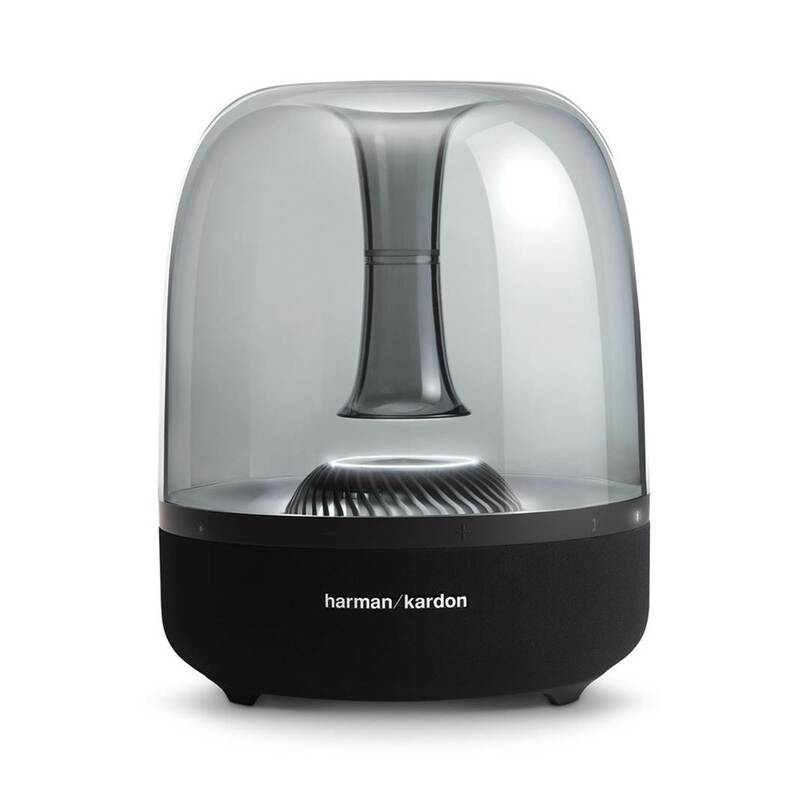 The Harman Kardon Onxy Studio 4 is one of the best speakers that delivers outstanding music quality with a sleek and modern design. The Studio 4 speaker is relatively large and fits nicely in living rooms or bedrooms – it has a unique curved oval design with two feet at the back to stabilize it. The sound performance from the Studio 4 is crystal clear, with crisp highs, detailed midranges and very deep bass response. The treble ranges are clear and smooth with great tonal clarity – you can also crank up the volume on the Studio 4 to maximum and practically hear no distortion which is really good. The Bluetooth connectivity on the Studio 4 is excellent and we did not experience any dips in sound quality while streaming music via Bluetooth – it also allows you to connect up to 2 Bluetooth devices at a time to the Studio 4 and multiple Studio 4 speakers together via the Harman Kardon Connect app. We liked the built-in microphone which provides crystal clear call quality for conferences. Overall, the Studio 4 is one of the best speakers available and we definitely highly recommend them if you want a good quality speaker for home audio entertainment. The Harman Kardon Aura Studio 2 is one of the best speakers that can produce a stunning amount of low-end bass with crisp sound quality. It is built to deliver 360 omni-direction sound and comes with ambient lighting which provides an aesthetically appealing white light glow from the center turbine with an animated ring of center LEDs. The Studio 2 features proprietary stereo-widening DSP technology which helps to deliver fully optimized audio performance. The speaker itself comes equipped with six high-midrange transducers and a dedicated subwoofer that delivers deep stunning lows and tight bass performance. It also comes with wireless dual sound feature that allows you to link two Aura Studio 2 speakers together to create a much wider sound-field. If you are looking for one of the best speakers that can produce stunning low-end bass and crystal clear music performance, the Aura Studio 2 comes highly recommended. We were surprised at how good the HK Aura Studio 2 sounded – the bass from the Aura Studio 2 goes very low and has plenty of depth. The bass is unlike any bass we have heard before – it hits tight and punchy and adds plenty of depth and complexity to the music. The low-end frequency ranges hit much harder than you would expect and adds a lot of layers to the music performance. Vocal performances sound really good on the HK Aura Studio 2 and the treble ranges are crisp and nicely defined. That being said, we did find that the higher frequency ranges on the Studio 2 sounded more mellow as compared to the Harman Kardon Onyx speaker. Instrumental music sounded decent with good attention to detail, although the speaker does not really pick up the subtle notes in the music as the speaker is more bass-orientated. Bass-heavy music genres such as electronic dance music performed exceptionally well on the Aura Studio 2 with really good deep lows – you can really feel the depth of the bass from the Aura Studio 2 and it fills up your room with powerful sound. You can also crank up the volume on the Aura Studio 2 speakers and it will not distort, although the treble ranges can start to buzz at the highest volume levels. In terms of design, the HK Aura 2 is a clear winner. It features a stunning coned-shaped like design and the tinted glass looks really good. The subwoofer is located in the center of the speaker and there is a center subwoofer hole which pumps out deep bass directly from the acoustic drivers. The design is aesthetically stunning and always makes for a good conversational piece in your home. We also liked the LED lights on the Aura 2 which gives it a nice aesthetically pleasing appearance. The wireless Bluetooth connectivity on the Aura 2 works like a charm and we did not experience any clipping noise or dips in sound quality while streaming music from our mobile device. We also liked the wireless dual sound feature which allows you to connect two Aura 2 speakers together to create a much wider soundstage – it’s ideal for outdoor spaces and large living rooms. The Aura 2 speaker looks really sleek and stylish and blends in nicely with modern home interior décor – it is a medium-sized speaker that does not take up much space and is easy to place around the home including on bookshelves or desktops. The Verdict? The Harman Kardon Aura 2 is one of the best speakers that delivers stunning lows and very deep bass performance. The sound quality from the Aura 2 is very crisp, with nice midranges and very tight lows that add plenty of depth and complexity to the sound. If you are in the market for a bass-heavy Bluetooth speaker, the Aura 2 will definitely not disappoint. Bass-heavy music genres such as electronic dance music hits hard and come with very tight and bass – the bass does not muddy into the midrange frequencies and stays where it should be as bass. It hits tight and goes really low – you can even feel the bass while listening to the Aura 2 speaker at 70% volume. We also liked the fact that the speaker does not distort at high volume levels, although the higher frequency treble ranges does start to roll off at higher volumes. The speaker has a really sleek and stylish design with ambient lighting that gives it a very unique appearance. It blends in nicely with modern home interior décor and makes for a great conversation piece in the living room or dining room. Overall, it’s one of the best speakers you can find that delivers the strongest bass and if you are a bass lover, we highly recommend this speaker for your home. The Bose SoundLink Mini 2 is one of the best speakers you can find that delivers exceptional sound from a small package. This speaker is capable of exceptionally big sound with deep bass for a full range listening experience, and can easily fill up a large room in your home with rich sound. It is designed to be wireless and ultra-compact for you to take the speaker virtually anywhere, and is able to connect to your Bluetooth devices for up to 30 feet range. It also features a built-in speakerphone which lets you take hands free calls on the go, and features an integrated lithium-ion battery which delivers a whopping 10 hours of continuous music playtime on a single charge. The voice prompts on this speaker also talk you through the Bluetooth pairing, making the Bose SoundLink very easy and intuitive to use. The Bose SoundLink Mini 2 is available in Carbon or Pearl colors and can also be customised with colored accessories to fit your preferences. Overall, the SoundLink Mini 2 is a great investment for those looking for one of the best speakers in a small and compact package. The sound performance of the Bose SoundLink Mini 2 is definitely some of the best that we have heard and a vast improvement over its predecessor, the SoundLink Mini. This speaker is capable of producing amazing sound quality at high or maximum volume with no distortion. From a music reproduction perspective, the SoundLink Mini 2 is capable of very high quality with incredibly crisp highs and detailed midrange, with stunning bass output. Music performances on the SoundLink Mini 2 came across as lifelike and bold, and we were surprised at how good these speakers were in creating that surround stereo effect as though we were listening to multiple speakers at the same time. The speaker can also get extremely loud and fill up an entire room with immersive and high quality sound; it’s the perfect choice if you need a speaker to keep the party going or to fill up a large room with music. It also has a sleek appearance which makes it blend in nicely with home décor. The Bluetooth implementation on the Bose SoundLink Mini 2 is seamless and intuitive to use. The speaker has the ability to remember up to eight paired devices and can be paired simultaneously to two devices at the same time. When you turn the speaker on, it immediately announces the battery level and the devices to which it is paired. If the first device stops and the second device starts playing music, the speaker will automatically switch to the second device. The speaker also comes with an integrated speakerphone for you to take hands free calls on the go, which is a nice added touch. We really liked the sleek and modern design of the Bose SoundLink Mini 2. The speaker feels weighty and solid when held in the hands, and has an overall sturdy and durable build. The SoundLink Mini 2 is also small enough to fit into small backpacks and can be conveniently brought around with you due to its portable size. 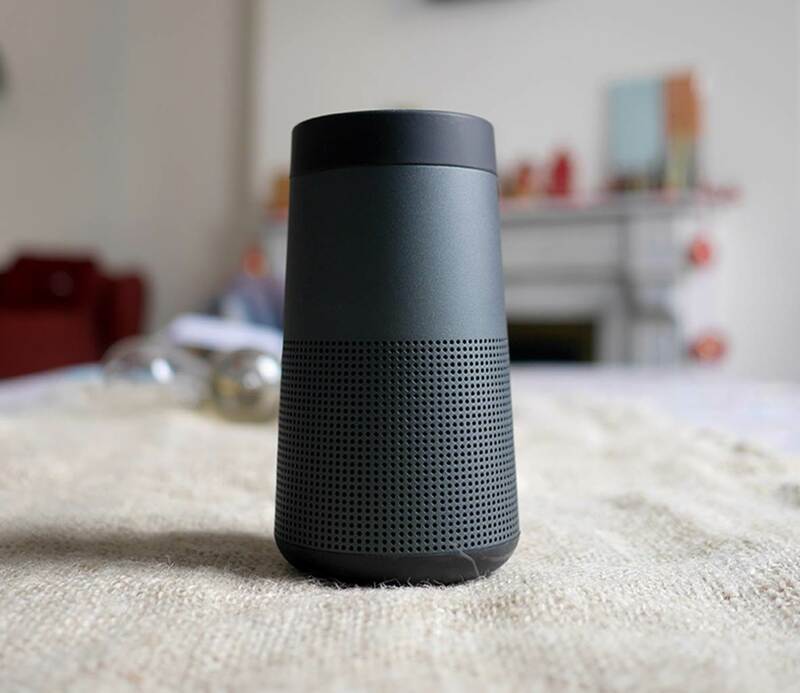 The Mini 2 has various improved features over its predecessor, including longer battery life of up to 10 hours of continuous music playtime, longer Bluetooth range and a mutli-function button for changing songs. It also comes with a micro USB charger for you to charge the speaker while connected to a laptop or electrical outlet. The speaker also has voice prompts which automatically tell you the battery life over time. The Verdict? The Bose SoundLink Mini 2 is one of the best speakers that packs great sound performance in a small package. This speaker is specially geared towards sound performance and music quality – they are some of the best home Bluetooth speakers we have listened to that managed to effectively articulate the details in the music with very good bass reproduction. 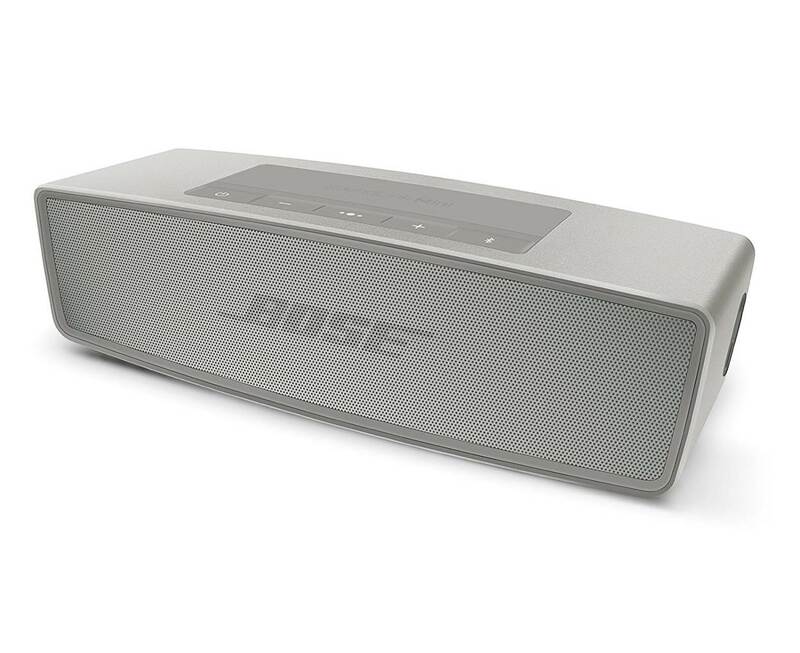 If you are very particular with your music, the Bose SoundLink Mini 2 will deliver exceptionally good sound quality. It also features the latest Bluetooth technology for consistent and high quality music streaming. The volume on the SoundLink Mini 2 can get exceptionally loud and is powerful enough to keep the party going through the night. It’s a great option for those looking for one of the best speakers with a relatively compact size and superb sound quality. The Edifier R1700BTs are some of the best speakers featuring a versatile and stylish design with crystal clear stereo sound performance. 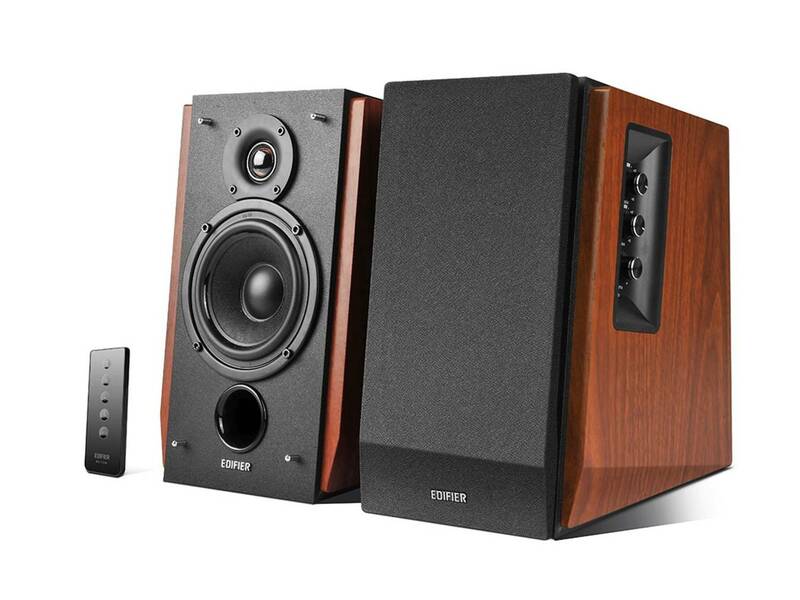 Edifier has taken dynamic audio power and combined it with a classic wood finish that gives their speakers finesse. These stereo speakers come with a 19mm dome tweeter and 4-inch bass driver which provides good natural tones, crisp highs and plenty of depth that will satisfy casual listeners and experienced musicians alike. The quality of sound is bolstered by the diversity of connections you can utilize as these speakers have two AUX inputs and Bluetooth. 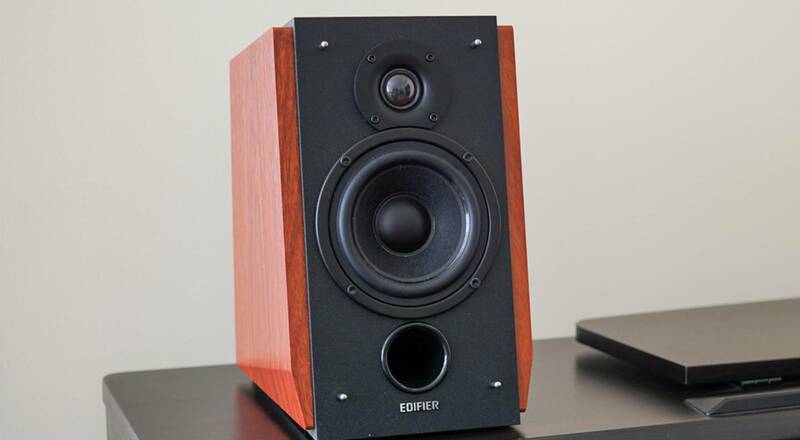 We liked the fact that the Edifier R1700BTs have an excellent design, proper sizing, a classic wood finish, and convenient remote control which make them highly versatile. They can easily blend into living rooms, bed rooms, home-offices, libraries, small businesses and of course home theatres. The Bluetooth connectivity also allows you to connect these speakers to a phone, tablet, computer, gaming console, TV or receiver where required. Overall, the Edifier R1700BT are some of the best speakers that provide a crisp and sound performance and we highly recommend them. The Edifier R1700BT speakers contain a 4-inch bass driver and a 19mm tweeter for notably clear and crisp sound. The front facing bass reflex port creates an emphasis on lower frequencies and gives the bass sufficient power. The R1700BT has built-in Dynamic Range Control and Digital Signal Processing to prevent distortion regardless of how you are utilizing them. Music lovers will appreciate that the quality maintains across all genres and audio-book listeners will be happy to see that this pair provides enough volume to fill the room. Being a designed as a 2.0 audio system the bass is adequate for most uses – the level of stereo separation that you get from both left and right channels is crystal clear. However; if die-hard audio enthusiasts want to make this part of their full audio solution there is 5-pin connector that allows it to be combined with other passive speakers and subwoofers for deeper bass performance. Overall, the Edifier R1700BT provides a level sound quality on par with higher-end Bluetooth bookshelf speakers and covers an entire audio-spectrum really well without any distortion at high volume levels. The Edifier R1700BT has a chic style and modern aesthetic that allows it to blend in easily into the modern home décor. The wireless Bluetooth connectivity on these speakers works like a charm and has a wireless range of up to 30 feet. The speakers come with a walnut wood effect vinyl that compliments a variety of interior décor. They have a dimension of 6in x 8in x 9.75in which make them portable and compact enough to fit into most bookshelves or on desktops without takin up much space. It also comes with a set of dials on the back that adjusts the treble and bass within a range -6db to +6db. This combined with a smart Bluetooth technology and two AUX ports creates an affordable multi-use sound solution that you can use how you want it, when you want it. It also includes your essential 16’ of speaker wire, a 4’ RCA to RCA and a 4’ 3.5mm to RCA for a diversity of connections. On top of all these design choices it also comes with a nifty remote that controls volume, sources and allows you to mute or unmute at your convenience. The Edifier R1700BTs are designed to fit in beautifully into your surroundings and can be used for sound landscaping or introduced as a front speaker for your home audio sound system. The Verdict? The Edifier R1700BT are one of the best speakers that have an aesthetically appealing design with crystal clear sound performance. It delivers quality sound combined with an age-old aesthetic and features a smart design that allows diverse connectivity and a level of convenience that that satisfies a multitude of listeners. These elements combine to fit the lifestyle you live. They are great for the casual listener or for musicians it comes with a 3.5mm auxiliary input to hook to your computer and allow you to listen to every single detail in the music with crystal clear accuracy. The classic wood finish compliments a variety of today’s home décor and their convenient size allows the you to place them where they are needed for your optimal audio experience. Overall, the Edifier R1700BTs are some of the best speakers with the versatility and sound performance for a wide variety of music listening needs and we highly recommend them. The Enclave Audio CineHome HD 5.1 is one of the best speakers designed for high quality audio performance and eliminates the need for an audio receiver or speaker cables. 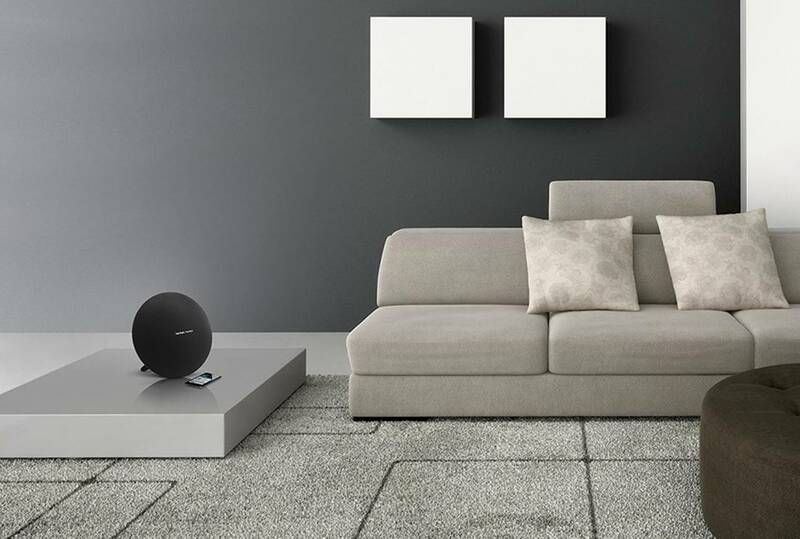 It is a completely wireless setup with the Enclave center speaker serving as the central hub for wireless transmission – although the surround sound speakers will still need to be connected to a power terminal. The speakers are custom designed and tuned for 360 degree 24 bit HD wireless audio sound; each speaker is built with two full-range drivers on opposite sides for enhanced surround sound performance. If you are looking for one of the best speakers that provide quality music performance, we highly recommend the Enclave Audio speakers. It is also compatible with Dolby Digital and DTS and delivers cinema-like sound even from stereo signals. The system comes with 3 HDMI inputs to connect to your cable box, DVD Blu-ray player, and also features 3.5mm analog, optical inputs and Bluetooth streaming functionality. If you are in the market for a fully wireless home theater system, the Enclave Audio CineHome HD 5.1 system is really your best bet. The sound performance of the Enclave wireless home theater system is nothing short of phenomenal. It produces very good 5.1 HD surround sound that permeates through the entire room. The sound coming from the surround speakers feels detailed and well defined, with crisp highs, very good midrange and strong bass performance. The surround sound speakers are each equipped with dual full-range drivers that deliver really spacious and crisp sound performance. Watching movies with the CineHome system feels like sitting in a real life cinema, with deep sound effects and bass response that hits hard and feels impactful. We also tested this system with a couple of soundtracks via Bluetooth streaming – electronic dance music sounded really punchy and hits hard, while orchestra music had plenty of soundstage and decent musical separation in the 5.1 system. The speakers really do a good job in reproducing subtle details which you might not have noticed in the recording before; the end result is that you get really good sound quality that feels natural, organic and uncolored. Overall, it’s the perfect system to have if you want a very good surround sound system without having to connect wiring around your home or living room. Setting up the Enclave CineHome is relatively simple and straightforward. You only need to place the speakers in the appropriate position, plug in the AC power adapter and load up the Enclave smart center to get started. The Enclave center speaker connects to the TV with a single cable and is compatible with HDMI and SPDIF optical sources. The subwoofer connects to the center system wirelessly, and syncs together with the wireless rear and front speakers. It also comes with a nice remote control which you can use to control the volume and basic functionality of the system. The Enclave Audio system delivers 24 bit uncompressed audio wirelessly which enhances the overall sound performance. We liked the fact that the system also comes with the Enclave Audio app which you can use with Android/iOS devices to stream music from your device or local network, or update the Enclave Audio firmware. The Wifi and Bluetooth transmission works as expected without any dips in sound quality or performance. The system generally supports HDCP 1.4 and it will pass 3D video sources without any issues. The only downside to this system is that it does not support HDCP 2.2 signals and you will need a workaround if you want to stream 4K video from your TV. The entire package comes with the two front wireless speakers, two rear wireless speakers, a wireless subwoofer, and the center channel speaker. The manufacturers also provide a remote control, power adapters, HDMI cables and user manual for easy reference. Overall, this is a 5.1 surround sound system that is really easy to setup and syncs together wirelessly without the need for speaker cabling which is the main advantage that you get with this setup. The Verdict? The Enclave Audio CineHome HD 5.1 wireless home theater system delivers very good sound quality and is easy to setup without the need for massive cabling around the room. The entire system is designed to be wireless – you get wireless front speakers, wireless rear speakers, wireless subwoofer and a center channel speaker that connects directly to your TV. In terms of audio performance, it’s hard to go wrong with this system. Watching movies with the CineHome felt as though we were sitting in a real life cinema with deep sound effects and crisp dialogue from the center channel speaker. Music performances from instrumental music and orchestra music sounded very consistent and detailed with a good level of soundstage. You really feel that you are immersed in the sound while listening to music with this setup; the bass response hits hard and feels impactful. The only downside to this system is that it does not support HDCP 2.2 which may be an issue if you want to stream ultra-high quality video through this system, otherwise you will have to use a workaround. Apart from this, the Enclave Audio CineHome is one the best speakers that you can find and we highly recommend them. 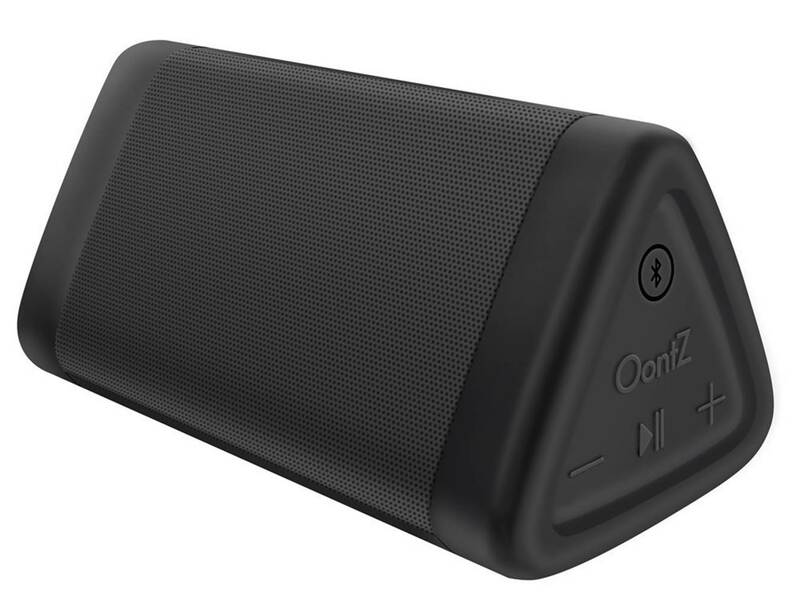 The OontZ Angle 3 Bluetooth Speaker is one the best speakers which provides a vast improvement over the previous generations of OontZ speakers. It is one of the best portable bluetooth speakers in terms of portability and sound – the Angle 3 provides high quality crystal clear sound with distinct mids and highs from two precision acoustic drivers delivering 10 Watts of excellent stereo and enhanced bass. It also features a nice proprietary passive subwoofer design that adds a good punch in the bass department. The end result is louder volume and more bass which is distortion free at high-volumes, and provides room filling sound which is perfect for indoor or outdoor parties. We particularly liked the clean design of the play/pause buttons which can allow you to pause/play without having to touch your phone. If you are looking for some of the best speakers that are compact and portable, the OontZ Angle 3 is definitely the one you should get. The passive radiator which produces the bass in the Angle 3 is located on the bottom of the unit. If you place it bottom down, the bass effect is more pronounced. If you want a little less bass, you can make it stand on its end. When its bottom down, the bass has a nice little thump. This design is truly an ingenious features which enhances the overall sound performance. The speaker has 10+ Watts of peak power, which is loud enough to fill up your backyard party with clear, great sounding music. The styling of the Angle 3 is far superior to the earlier generation. The stick-on rubber knobs on the bottom of the earlier generation have been replaced by two inch rubber strips set into the recesses on the bottom of the speaker. This provides more resistance to moving forces and is perfect for long distance car rides. Furthermore, the Angle 3 features a built-in mic for handsfree speakerphone for use with smartphones and iPhones; you can easily connect this device with iPhone, iPad, iPod, Samsung, Kindle, Smartphones and other Tablet devices. This means that you can take phone calls with this device while driving or travelling, which is pretty neat. The Angle 3 is also built to be water resistant up to IPX5, which means it is splashproof, rainproof, dustproof, sandproof and perfect for beach, poolside, or boat uses. The Bluetooth connectivity on this device is super easy. It connects from one device to another effortlessly. You don’t even need to press a button the speaker to pair it with a different device as it simply pairs intuitively. The battery life on this speaker is about 7 hours, which is less than the Plus unit, which does 12 – 15 hours of use. This is partially because the battery is driving much more sound and requires extra battery power. All that is required with this trade-off is to simply charge the device more frequently. The Verdict? The OontZ Angle 3 is one of the best speakers and has no real negatives to mention. Overall, it is a very solid speaker and now has outstanding volume and good bass. It produces great sound in a small compact package and weighs in at about 9 ounces. It’s a great looking speaker with a unique design, and Cambridge Soundworks has really demonstrate a vast improvement on the sound quality instead of loading up tonnes of other features. Overall, the Oontz Angle 3 are some of the best speakers you can find that is selling at a very good price at the time of writing and definitely worth checking out. The UE Wonderboom is one of the best speakers you can find with a stunning and eye-catchy design that is completely waterproof. The entire speaker has a very unique circular shaped design that looks and feels solid – it is capable of delivering crisp and clear 360 degree sound for you to keep the party going through the night. The entire speaker is IPX7 waterproof which means that you can submerge this speaker underwater up to a depth of 1m for 30 minutes without any issues. The Bluetooth connectivity on the UE Wonderboom is excellent, and can go up to 100 feet in length when unobstructed. 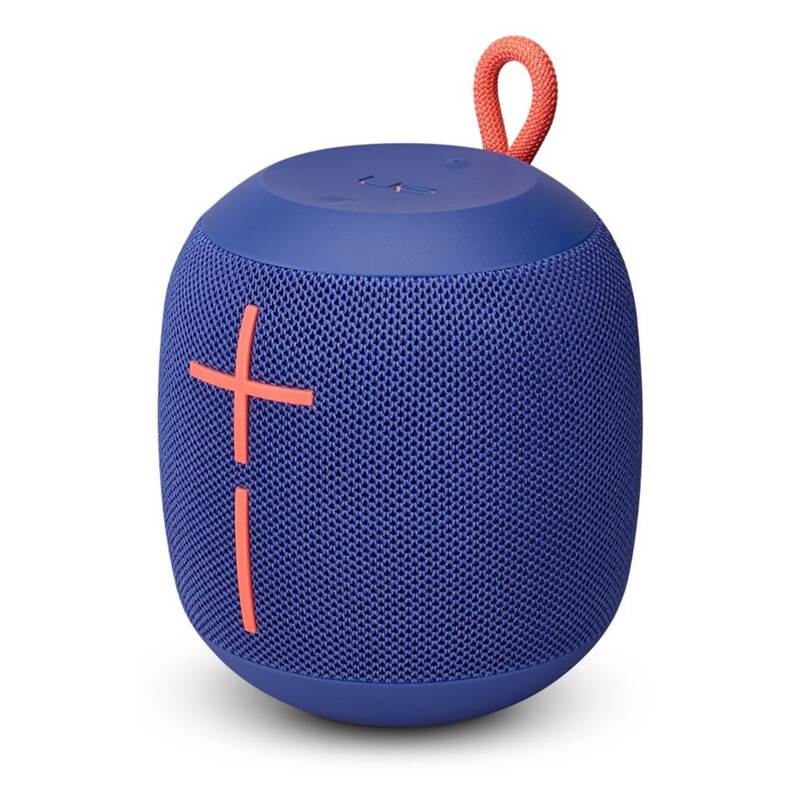 The battery life on this speaker lasts a good 10 hours of continuous playtime on a single charge, and you can also connect the UE Wonderboom with other Bluetooth devices at the same time. 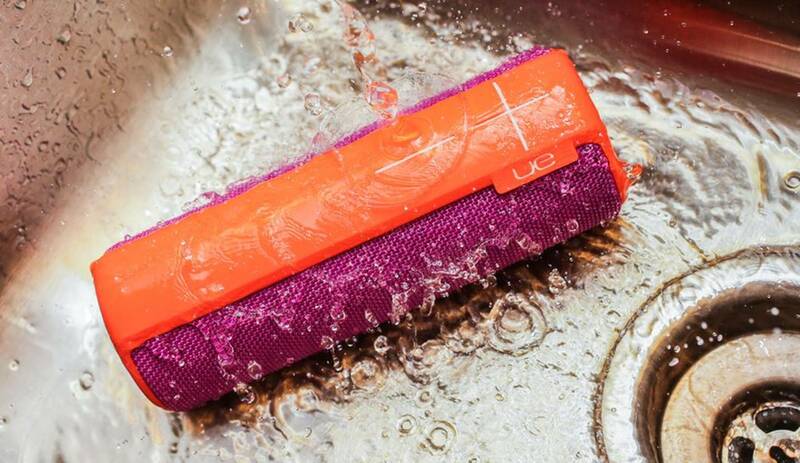 If you are looking for one of the best waterproof Bluetooth speakers with an exceptionally good and aesthetic design, the UE Wonderboom is definitely the speaker you are looking for. The sound quality of the UE Wonderboom is pretty amazing – you can crank this speaker up the maximum volume and it will produce crystal clear sound without any distortion. The acoustic drivers on the UE Wonderboom are capable of producing 360 degree sound, which means that you can place it virtually anywhere and expect to hear the same degree of sound output. The sound performance on the Wonderboom is clear, crisp with deep bass response – the bass response feels solid and weighty, which adds an extra kick to your music. The sound quality feels rich and full, and we were impressed by how much it is able to reproduce the lower frequencies with authority. The multidirectional sound also makes the UE Wonderboom a great speaker to have in the pool or while doing water sports – you will be able to hear the speaker from any angle and it sounds just as good as before. The entire UE Wonderboom is built like a tank – it features an IPX7 waterproof design which means that it is completely waterproof. It is also shockproof and will survive a drop from up to 1.7 meters in height. We liked the fact that this speaker came with a hang loop which easily allows you to strap the speaker to any bag or backpack on the go. The buttons on the speaker are tactile and intuitive to use, which makes operating the UE Wonderboom a breeze. The great thing about the Wonderboom is that it actually floats in water which is great for water sports or having fun at the pool. The speaker is suitable for use with almost any water activity, including showering or swimming. You can even pair the UE Wonderboom with another Wonderboom without the need for any app or software for a larger soundstage and better music performance. The battery life on the Wonderboom lasts a good 10 hours on a single charge which is a good amount of time for outdoor activities. It is also built to be highly compact and portable, and you can easily strap it to your bag or backpack and take it with you on the go. The Bluetooth connectivity on this speaker is excellent, and you will get crystal clear sound with detailed clarity when connected to your mobile device. 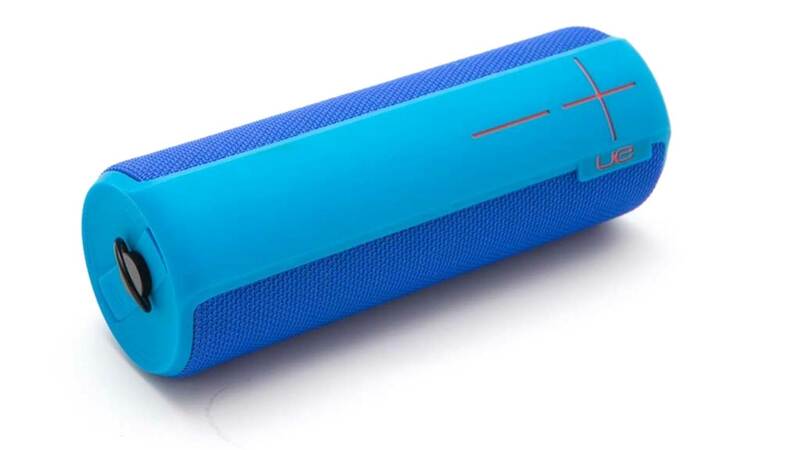 The Bluetooth range goes up to an incredible 100 feet, which makes it one of the longest you can find for a waterproof Bluetooth speaker – so long that you can literally leave the speaker out in a large backyard while streaming music from your home. The speaker connects to virtually all Bluetooth devices, and works well with smartphones, tablets and laptops with Bluetooth connectivity. The Verdict? The UE Wonderboom is one of the best speakers you can find that delivers multi-directional sound. It features an IPX7 waterproof design and is capable of floating on water, making it suitable for a wide variety of water-sports and water related activities. In addition, the sound performance of the Wonderboom is simply top-notch and produces crisp and good midrange, with booming bass. 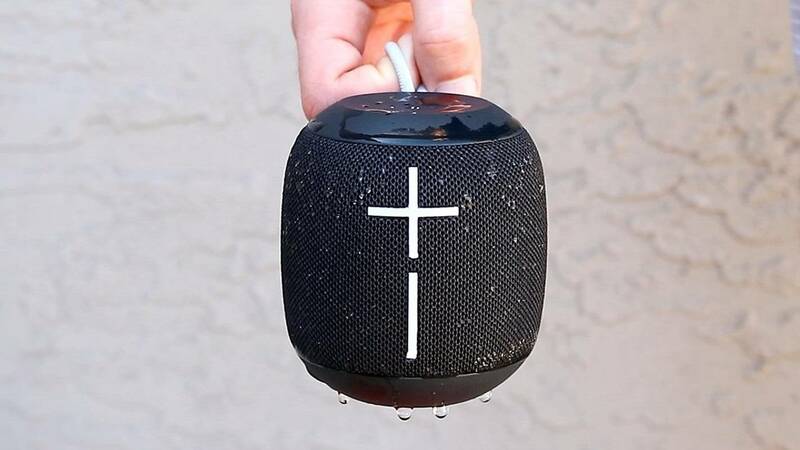 This makes listening to the Wonderboom a very enjoyable experience and the speaker can easily project sound while in the pool or by the beach. You can also use the Wonderboom as a shower speaker and listen to music without having to worry about the speaker. It’s one of the best speakers you can find that has a very solid and unique design, and we highly recommend them. 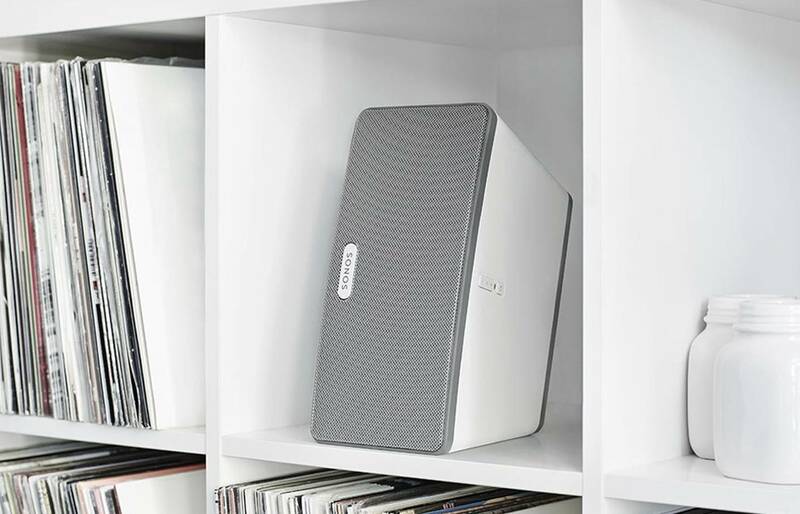 The Sonos Play 3 is one of the best speakers that deliver richer, deep sound with more powerful bass than its predecessors in the Sonos Play series. The Play 3 is able to deliver rich and clean sound with deep bass, and comes equipped with three Class-D amplifiers and three custom built drivers which create a full and wide soundstage which brings out the details in vocals and instruments. It is also equipped with a rear-firing bass radiator which pumps out exceptionally deep lows for a speaker of this size, and sounds great in virtually any position due to the Trueplay speaker tuning which optimizes sound performance in your preferred orientation. You can also wirelessly pair the Play 3 with another Play 3 into separate left and right channels for a bigger and deeper stereo sound. The Play 3 will pair wireless to your home Wi-Fi or mobile device through an app, and can stream music from Pandora and Spotify without any issues. If you are looking for one of the best speakers that deliver very good sound performance, the Sonos Play 3 is an excellent choice. The sound performance of the Play 3 is phenomenal and much better than we expected. The best thing about the sound performance is how crisp and detailed our music sounded, and you can hear details in the music which you have never heard before. The highs and mids are very clearly defined and crisp, and it also has a nice bass response that feels impactful and goes very deep. We also liked the soundstage on the Play 3 which felt really spacious with good musical separation; you can hear the details of the music as if you were in a live concert, although there are some practical limitations due to the size of this speaker. That said, we absolutely loved the excellent sound quality from these speakers and thoroughly enjoyed listening to music and instrumental performances on the Play 3. The Play 3 has a minimalist, versatile design that fits nicely in almost any setting, and can be positioned vertically or horizontally, or use as home theatre rear speakers and as a stereo pair. It is specially designed to optimize sound based on your preferred orientation, so the sound quality will remain just as good in virtually any position (although we recommend placing it near a wall or better bass resonance). 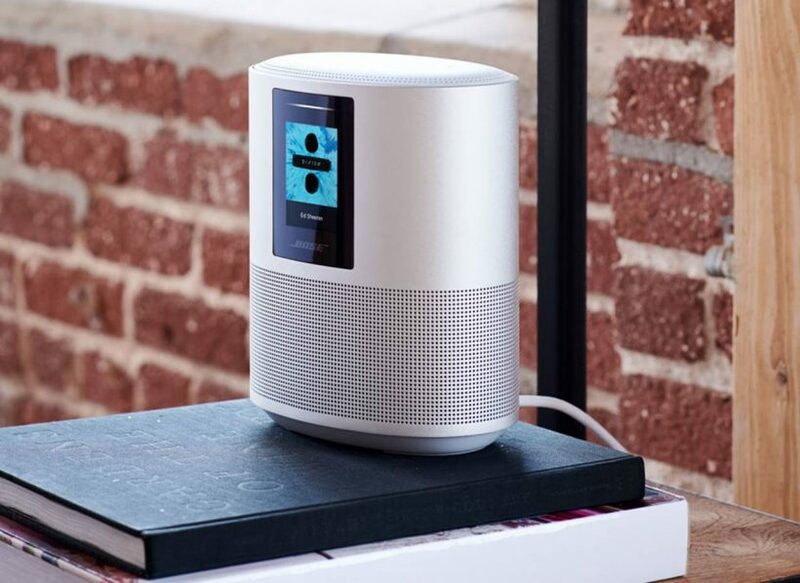 The Play 3 is also incredibly easy to set up – you can connect to this speaker using your home Wi-Fi and expand your home audio system by adding more wireless speakers to additional rooms. With this setup, you can play different songs in different rooms at the same time, or play a single song in perfect sync throughout your home. Since the Play 3 uses Wi-Fi wireless connection, the sound quality is preserved through the Wi-Fi connection and there are no dips or drops while streaming music. With that in mind, you will need to install the Sonos app in order to properly use this speaker. The Sonos app simplifies all the functionality into a simple menu and you can create playlists easily by the touch of a button. That being said, the Play 3 does not connect like a traditional Bluetooth speaker – you have to connect the speaker to a wireless access point and then connect to the speaker through the app. The app well designed and provides you with the ability to have the speakers work in group sync or as an individual speaker, and allows you to control the sound in different speaker units. The app also comes with a nice function that allows the speaker to tune itself to the room and adjust the sound accordingly to get the best sound quality from the Play 3. The Verdict? While the Sonos Play 3 does require a wireless access point and an app to stream music, it is one of best speakers in terms of sound performance and does an extremely good job of tuning itself to the surrounding environment to optimize the sound quality. The highs and mids on the Play 3 are exceptionally crisp, clear and detailed, and we were very impressed with the bass response which felt impactful, deep and powerful. The sound from the speaker has a certain presence and authority that makes it feel very enjoyable to listen to. 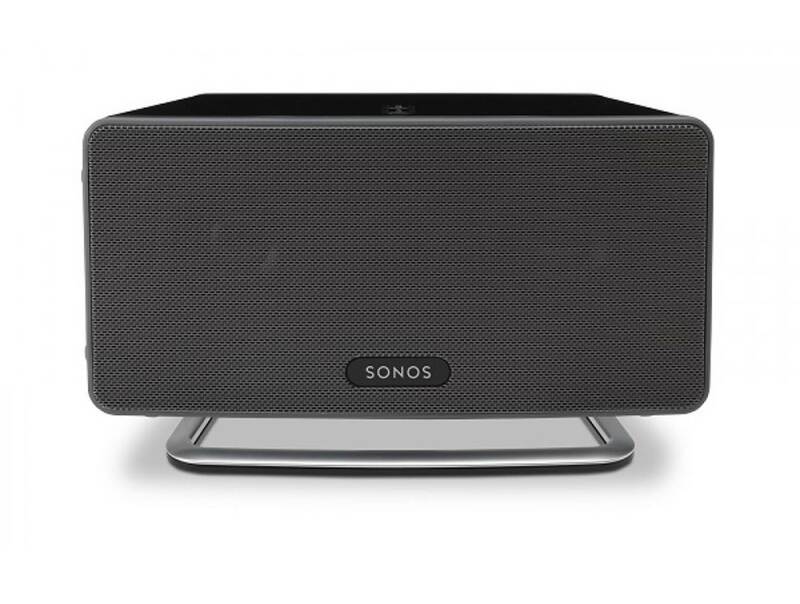 The design of the Sonos Play 3 is clean and minimalist, and is inconspicuous enough to blend in easily into the room. The Play 3 can also fill a large room with powerful sound without any distortion, and is suitable as rear speakers for your home theatre system. If you are looking for one of the best speakers with extremely good sound quality and deep bass, the Sonos Play 3 is the speaker you should get. The JBL Arena B15 is one of the best speakers with superb sound quality. It comes with a powerful 1 inch (25mm) soft dome tweeter which provides clean and crisp highs, together with a 5.5” (140mm) polycellulose woofer with room-filling sound performance. These speakers are capable of producing a tonne of volume output and fill up the entire room with rich and clear music for TVs and gaming. It comes ready with integrated wall-mount solutions for flexible installation and system configuration, and also works as a bookshelf or surround speaker in stereo or multi-channel systems. We liked the fact that the JBL Arena B15 has a wide frequency ranging from 100Hz to 40kHz, and a sensitivity of 86dB. It also features a contemporary all black cabinet shape and all black grilles which provide a sophisticated, modern look. On the whole, the JBL Arena B15 is one of the best speakers that offer a great combination of sound quality and design with integrated wall-mounts. The JBL Arena B15 delivers crystal clear highs and midrange frequencies – vocal performances sound lifelike and clear with its 1” soft dome tweeter. The mid base is sound punchy with plenty of depth – the 5.5” woofer adds plenty of punch especially to the mid-range and lower-range frequency ranges. When we tested the JBL Arena B15 speakers, we were surprised at how well-balanced the sound from these speakers was – instrumental performances and piano notes come across as clear and lifelike with good separation and detail. The soundstage that you get from these speakers is impressive and the stereo separation between both left and right channels is crisp. That being said, the JBL Arena B15 are not meant to be surround sound speakers. The bass response is tight and punchy although it would definitely benefit from the addition of a subwoofer to fill out the low end ranges. These speakers only have a frequency range down to 100Hz. The JBL Arena B15 has enough volume to fill up a large room with rich and clear sound and we liked the fact that you can crank up the volume to maximum without hearing any distortion. For best performance, we would recommend breaking in the JBL Arena B15 speakers for around 24 hours to allow the sound to mellow out. 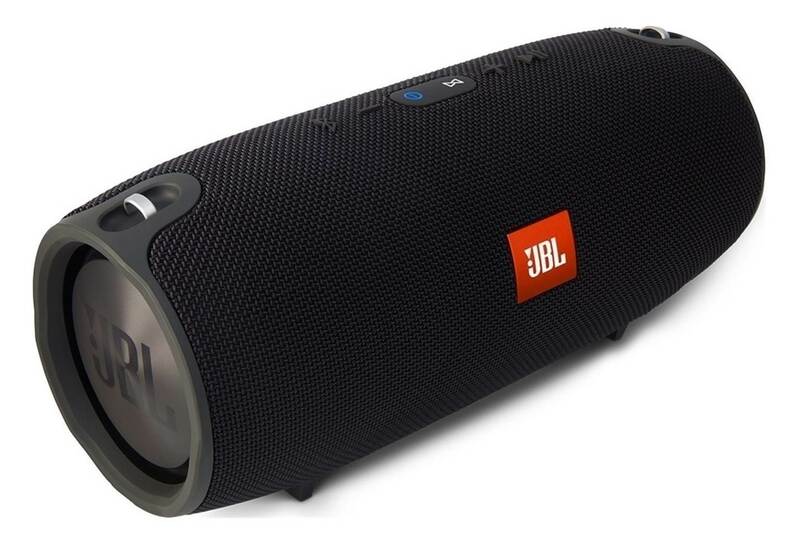 The JBL Arena B15 has a high quality build that feels modern and durable. These stereo speakers come with integrated wall mounts which makes it possible to mount them on a wall apart from placing them on the bookshelf. They can securely hang with the metal keyhole hangers on the back. It has a contemporary look to it and blends in nicely with modern home interior decor. That being said, the speaker comes in small cabinet and is sealed, so do expect some sonic resonance from the JBL Arena B15. To achieve tonal balance in such a tiny box, the engineers had to attenuate the tweeter, which may lower its efficiency rating. We liked the fact that the JBL Arena B15 has a solid MDF construction and weighs around 17lbs which is indication that it is made of quality materials. 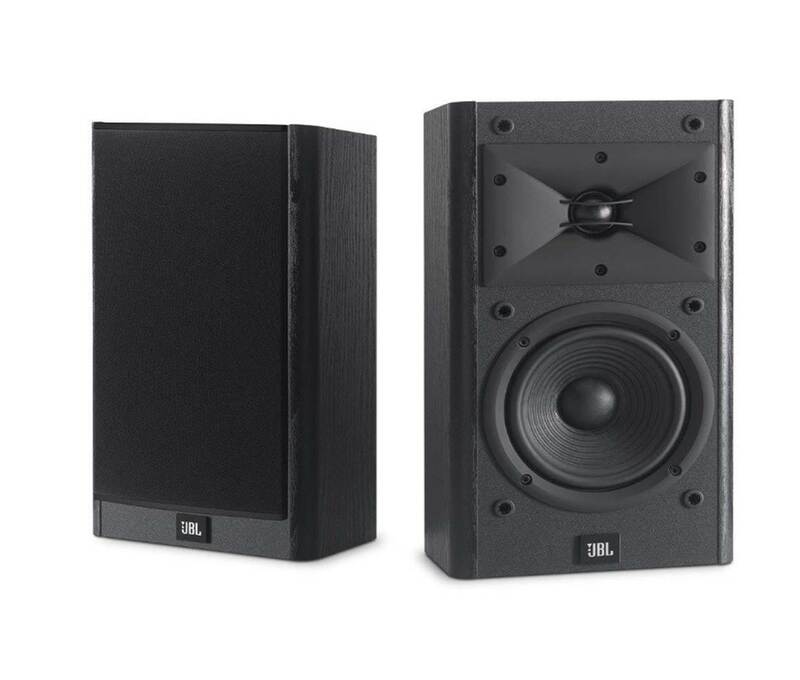 The build quality of the JBL Arena B15 looks solid and sleek and can be used as bookshelf speakers or form part of your home theater system as frontal or rear channel speakers. The Verdict? The JBL Arena B15 are some of the best speakers with crystal clear vocal reproduction and good soundstage. The tweeters deliver clean powerful highs with great attention to detail. While the midrange sound on the B15s is enhanced by the 5.5” woofers, these speakers have a shallow cabinet which reduces the overall bass reproduction and would definitely benefit from the addition of a dedicated subwoofer. We liked the fact that the JBL Arena B15 have integrated wall mounts which make them easy to mount on the wall and fit into an integrated home theater system. We liked the fact that the B15 speakers are housed in durable MDF cabinets and have a sleek and modern looking design. It also weighs around 17lbs per piece which is not too heavy to be placed on bookshelves. On the whole, the JBL Arena B15 is one of the best speakers that deliver crystal clear sound performance and clarity, and we highly recommend them. The ARCHEER A320 is one of the hardest hitting, beautifully designed best speakers you can find at a very good price. The A320 speaker features dual 5W drivers which produce detailed midrange and crisp highs, with one 15W subwoofer which produces incredibly punchy bass. It comes equipped with Bluetooth 4.0 technology for easy wireless pairing with smartphones, iPads, tablets or other wireless devices. The built-in rechargeable 5200 mAh li-ion battery can deliver a whopping 11 hours of playtime at 50% volume, and you can also purchase a separate ARCHEER 17W 3.4A wall charger or USB charger to quickly recharge the speaker. Overall, the A320 speaker pumps out some serious audio performance with its dual 5W drivers and is great for small gatherings, parties or as a home TV speaker. The ARCHEER A320 is designed for high-fidelity audio reproduction and delivers sound performance that is incredibly enjoyable to listen to. The speaker carries two drivers for the midrange and high frequencies, with a single woofer in the center for low-end frequency extension. This speaker has a very good crossover design which improves sound integration with the tweeters and subwoofer, and creates a very impressive frequency band. The end result is that the sound feels rich and detailed, with crystal clear midrange that does not sound muddy. The bass on this speaker sounds clean and tight, and stays where it should be without becoming overpowering or muddy – each bass beat is well separated from the other aspects of the music. With this in mind, the A320 speaker is incredibly good for playing a wide range of music genres including classical, acoustic, rock and pop – the vocals sounded rich and detailed, with crisp highs and incredibly tight midrange as well. While most stereo setups are often lacking in bass or midrange, the A320 speaker manages to hit the sweet spot by producing clear stereo sound with detailed mids and deep bass. This unique combination greatly enhances the music listening experience, and makes the ARCHEER A320 one of the best wireless speakers you can listen to with full-bodied audio reproduction. 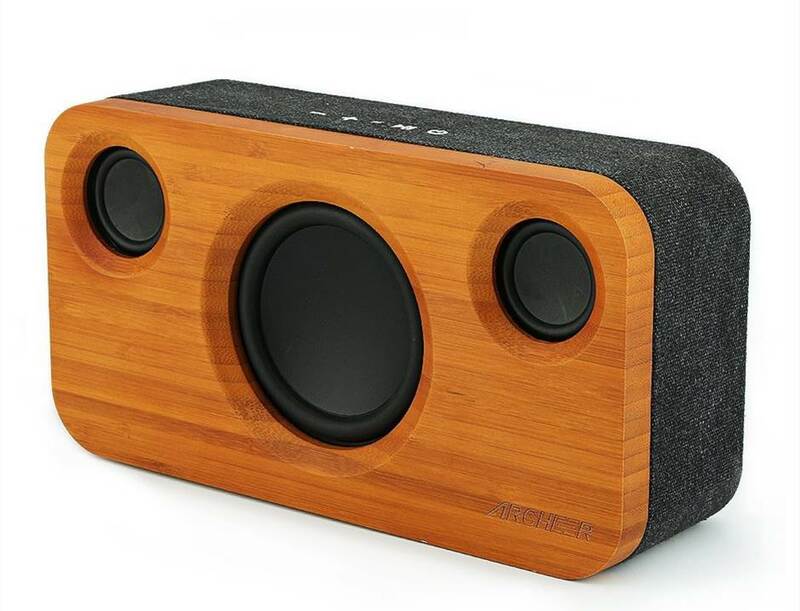 The ARCHEER A320 speaker has a heavy and solid construction with a unique bamboo wood design. The bamboo feels thick and has a beautiful finish, and looks like a piece of art which blends in easily into modern home décor. The speaker also has great volume output and you can easily fill your entire room with sound by cranking it up to just 50-60% volume. While you can connect to the A320 speaker via wireless connection, you can also use the AUX line-in jack for non-wireless audio sources. You can also adjust the audio output with an equalizer app and fine tune the speaker’s output if you are using your mobile device to stream music. On the whole, we would say that the A320 speaker looks very high quality and sounds expensive, which is a pretty rare combination for a speaker of this size. The A320 speaker comes with an auxillary cable as well as a USB to micro USB charging power cable. It also comes with an instruction manual with instructions on how to set up the speaker. While you can use the included micro-USB cable to charge the speaker, the manufacturers do recommend purchasing a separate wall charger which charges the speaker quicker. Connecting our wireless mobile device to this speaker took a couple of seconds and the connection was instantaneous. The speaker also blends in easily into modern home décor and looks pretty classy with the bamboo wood finish. The Verdict? The ARCHEER A320 is a beautifully clean, bamboo wood speaker with rich sound and tight sounding bass. It’s one of the best speakers in terms of design and sound performance, and feels and looks expensive. Despite the small size of this speaker, it sounds extremely good and is able to pump out detailed and rich sound performance without any distortion at higher volumes. We would also mention that the drivers on this speaker are very well implemented with the subwoofer and the end result is that the sound feels rich and beautifully defined. Our only minor quibble with this speaker is that it charges via a micro USB and we would have preferred a dedicated power charger to quickly charge up the speaker. That being said, the ARCHEER A320 is still hands down one of the best speakers ever designed with a beautiful bamboo finish and rich clean sound that will definitely impress you for a long time to come.